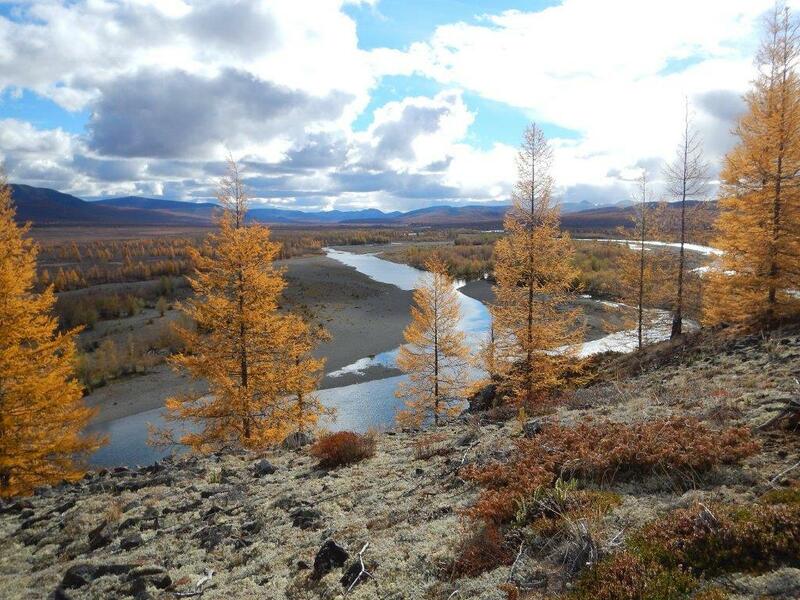 Russia covers most of the euroasian north so it offers a wide variety of landscapes and climate conditions. 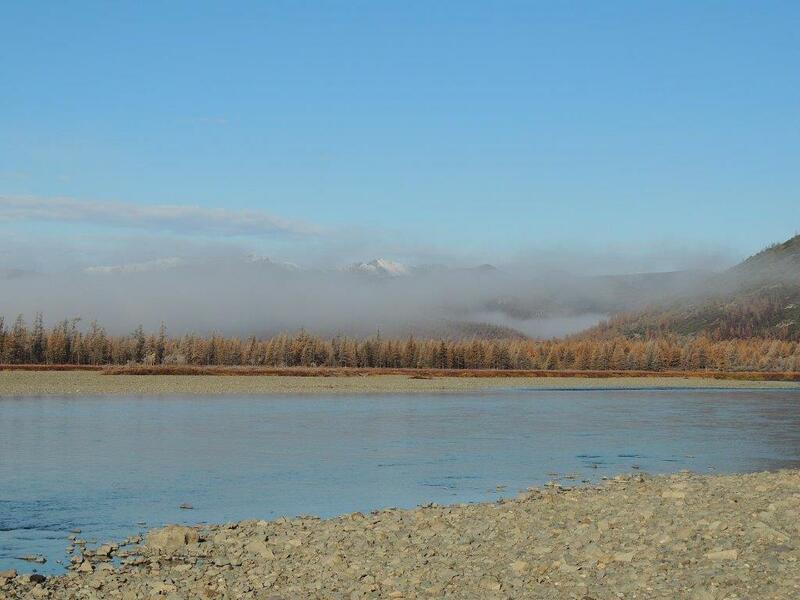 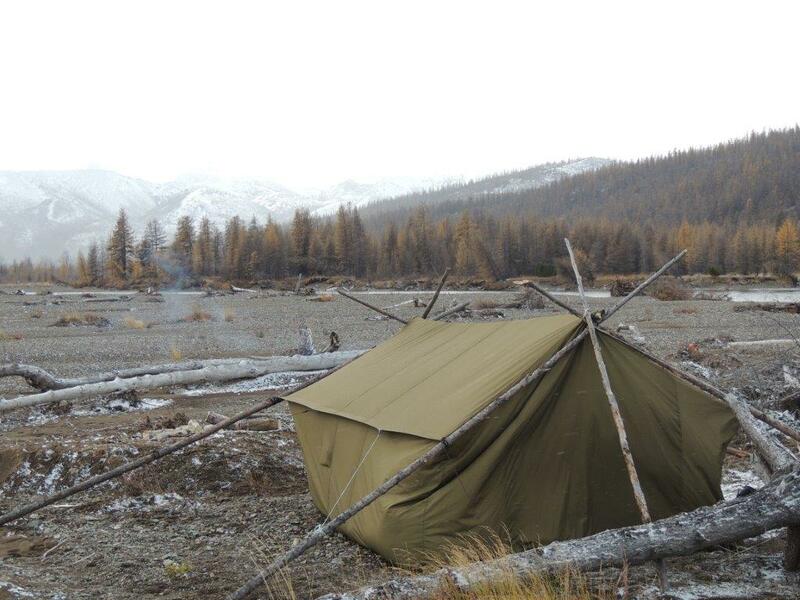 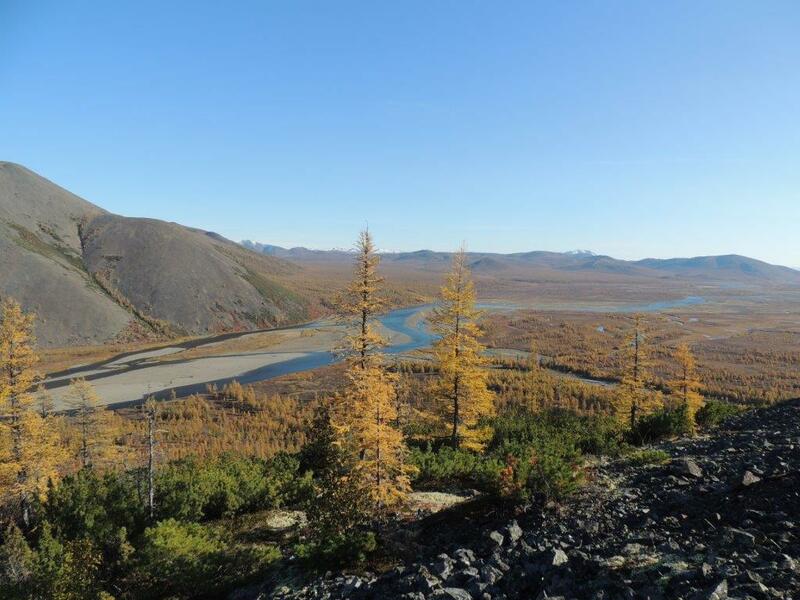 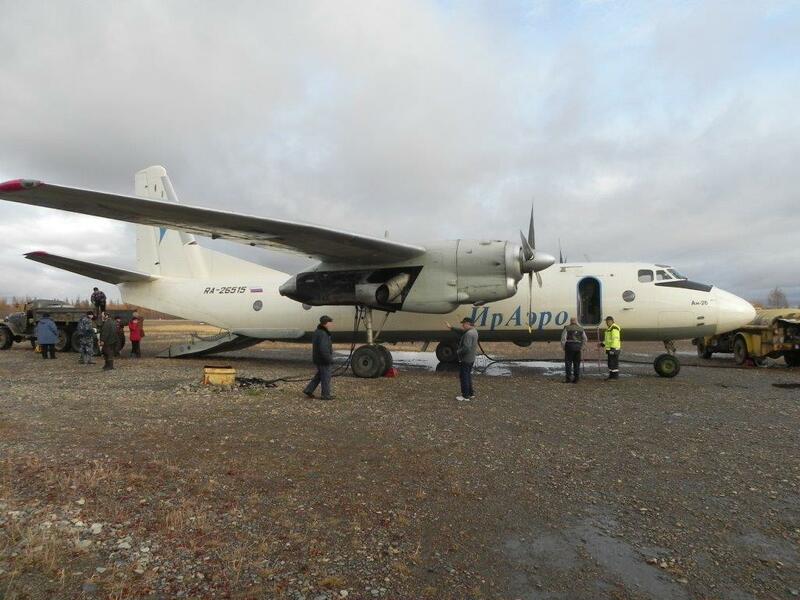 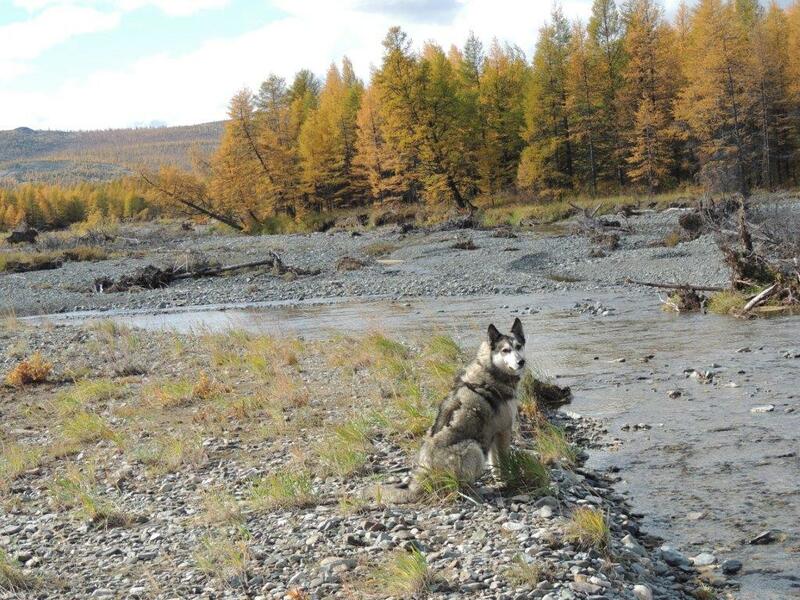 Most of the area is a huge flat terrain known as tundra, this is call Siberia and it runs from Europe to Asia. 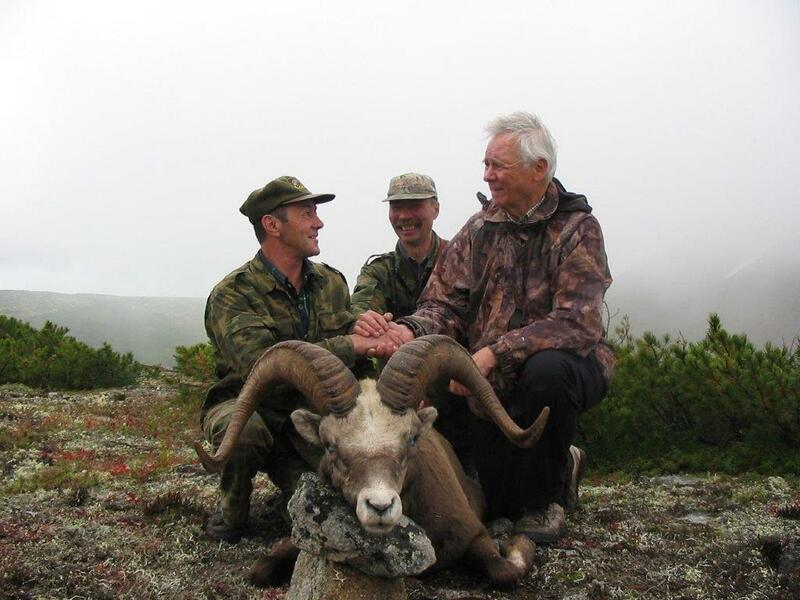 In the south we find the Caucasian mountains. 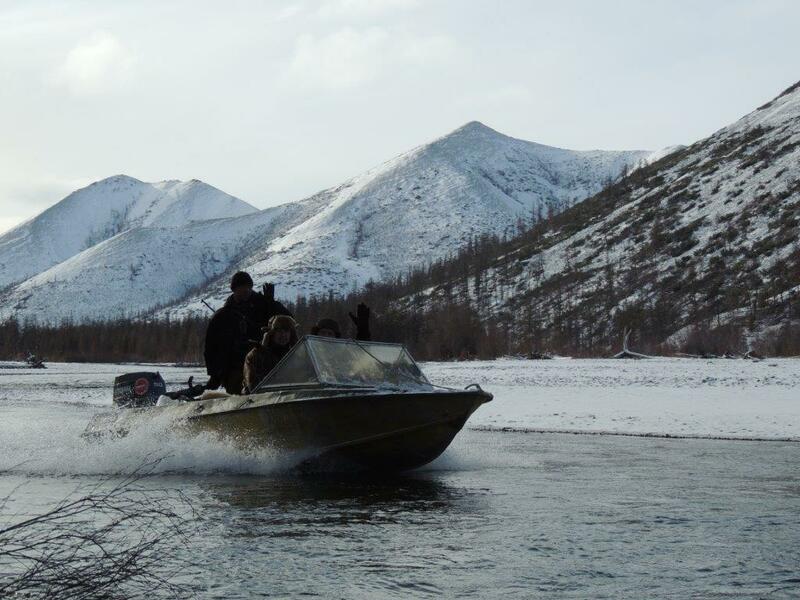 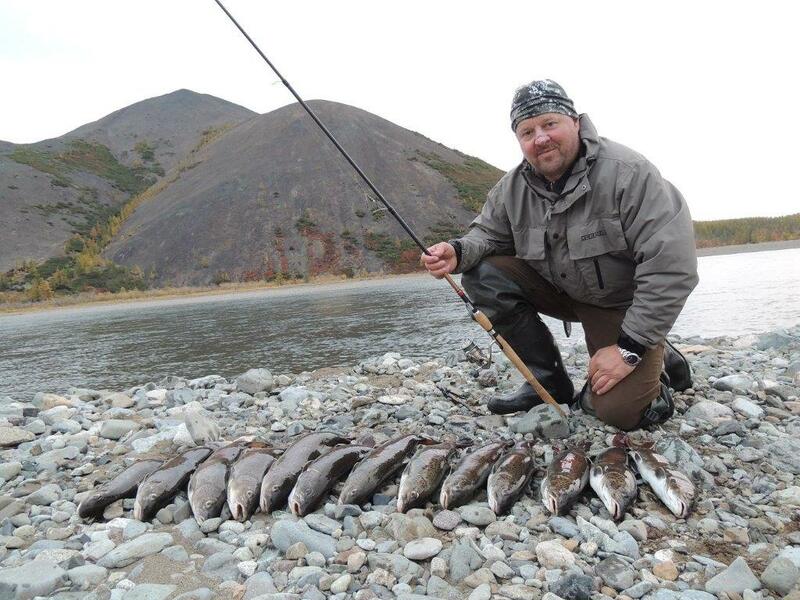 Kamchatka is one of the most popular areas for hunters and it is on the east, it is separated from Alaska by the Bering sea. 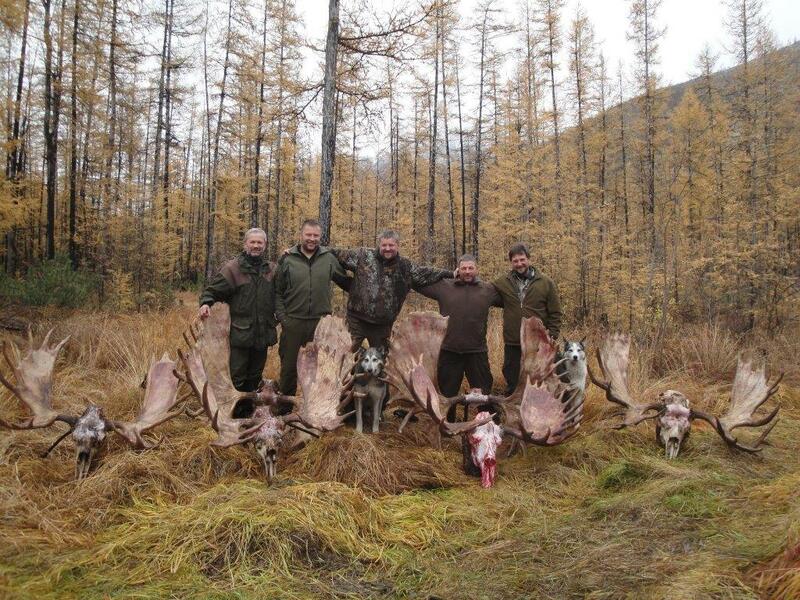 Here we can find the moose, bear, linx, capercaillie, snow sheep, wolf….. 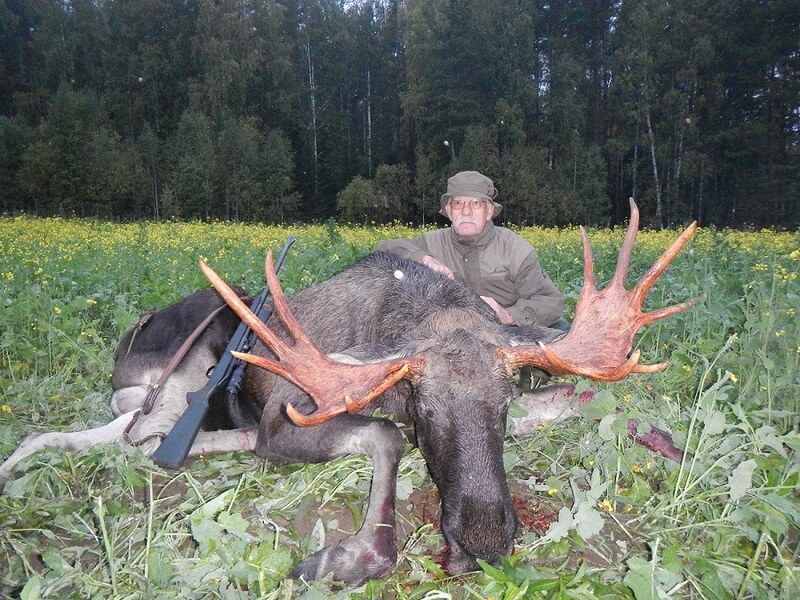 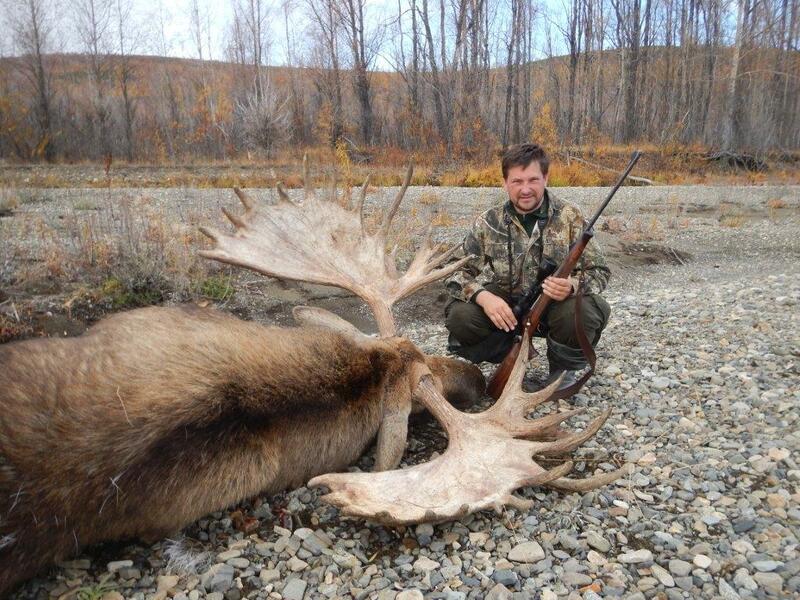 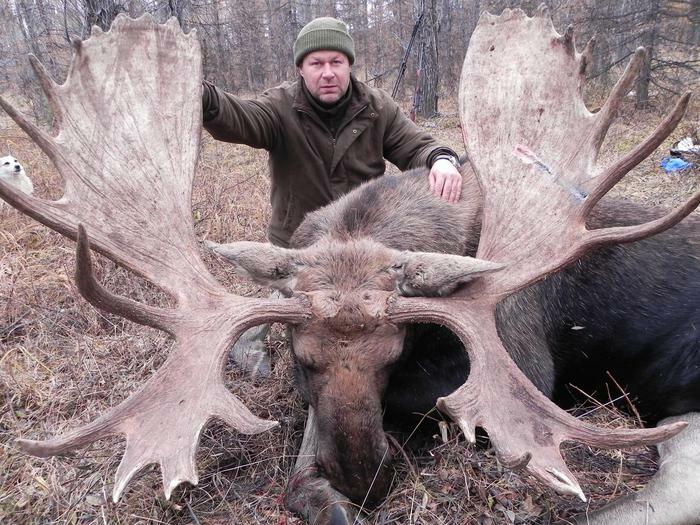 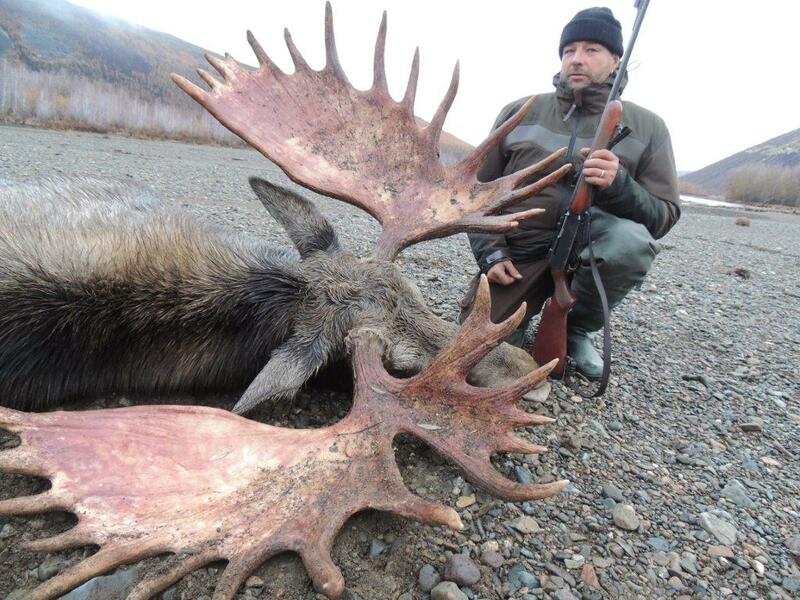 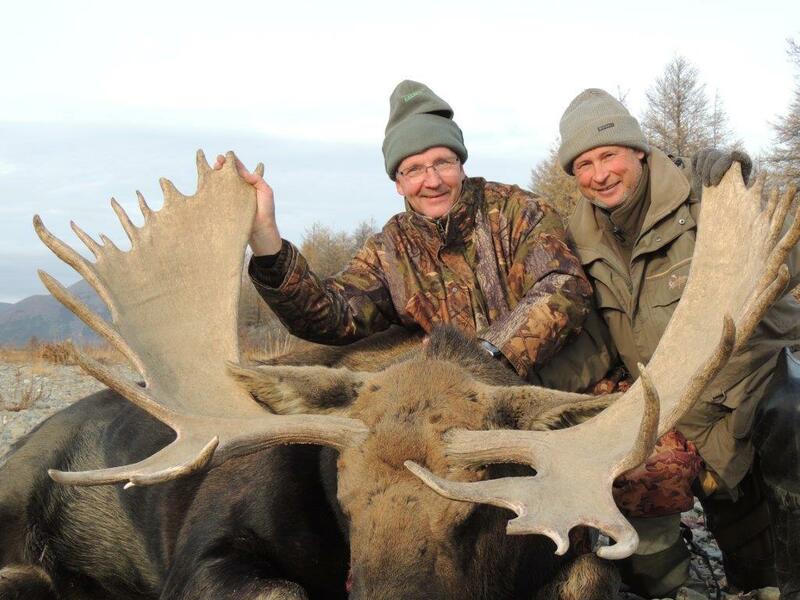 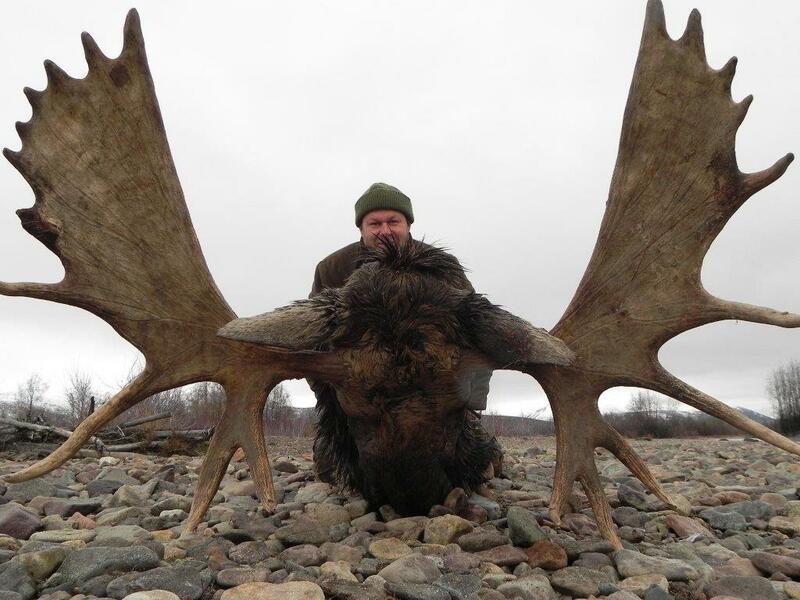 In Kamchatka we find the biggest moose of the world. 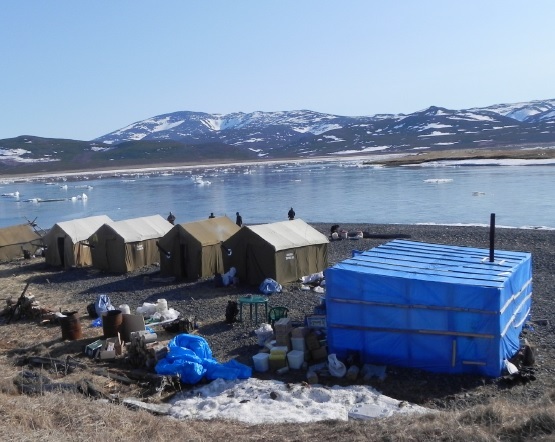 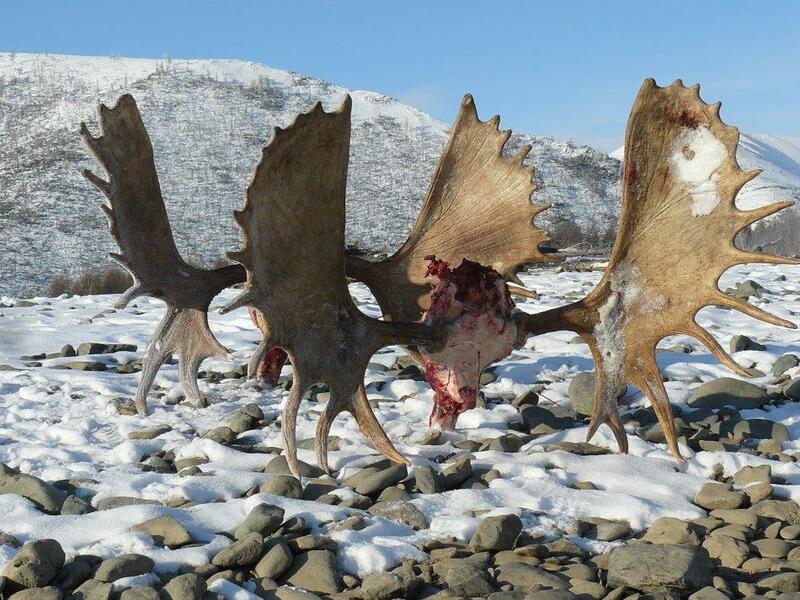 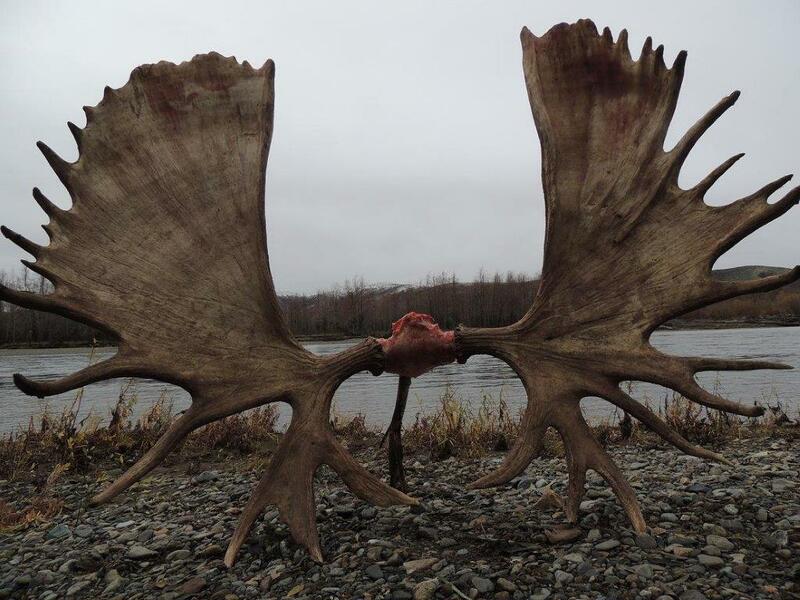 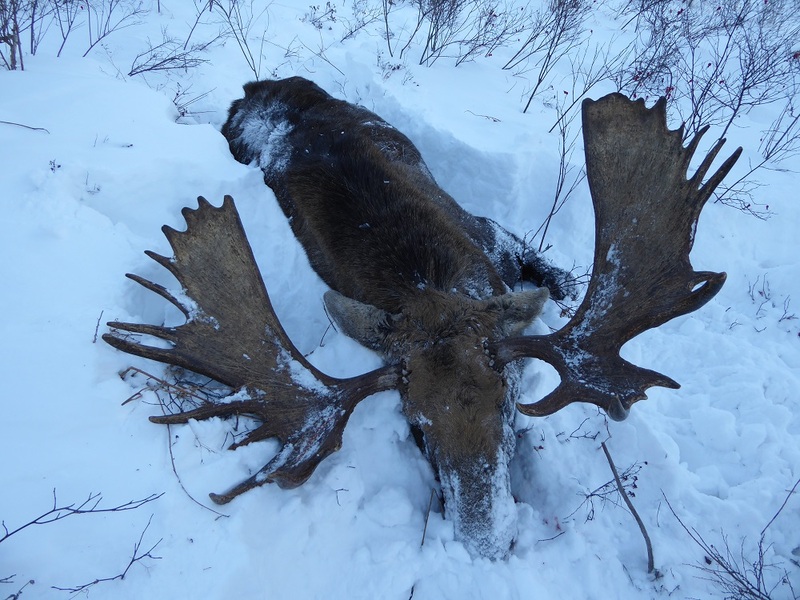 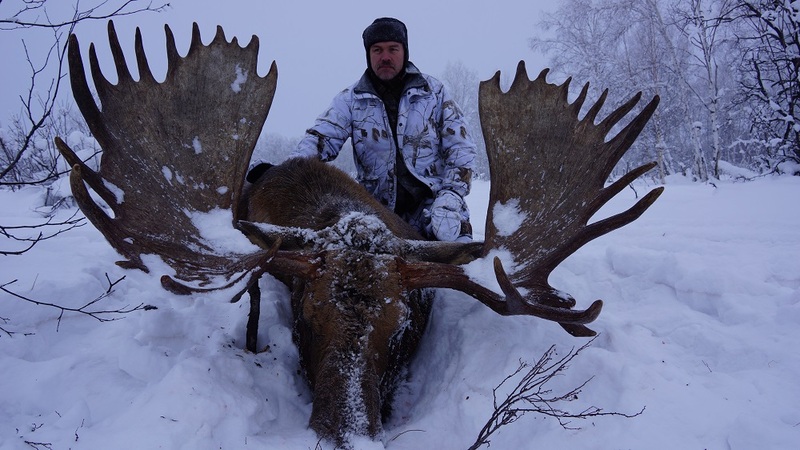 It has been hunted for many years but it is so big that there are still many areas with very low hunting pressure, this is why it is importat to use the helicopter to go to the camp so we will reach far areas. 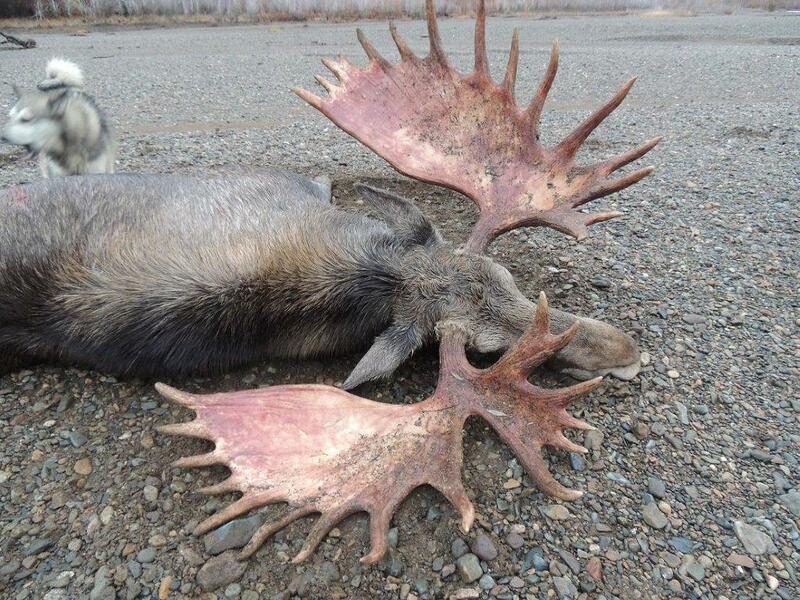 It can be hunted from September to December, in the fall it can be combined with bear. 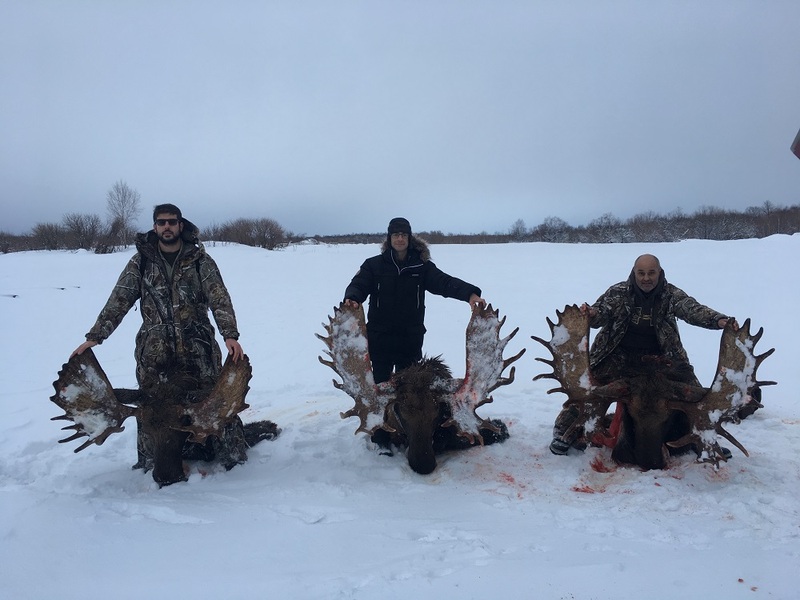 The best time is the end of November or begining of December, during this time you use snowmobiles to move, there are no leafs on the trees so the moose cannot hide. 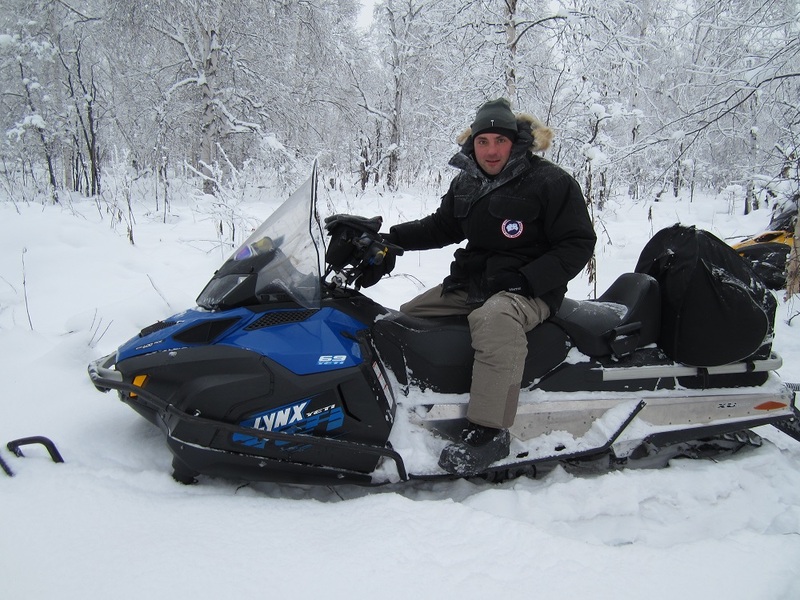 Thanks to the snowmobiles you can drive around 60-80 km per day so you cover a great area. 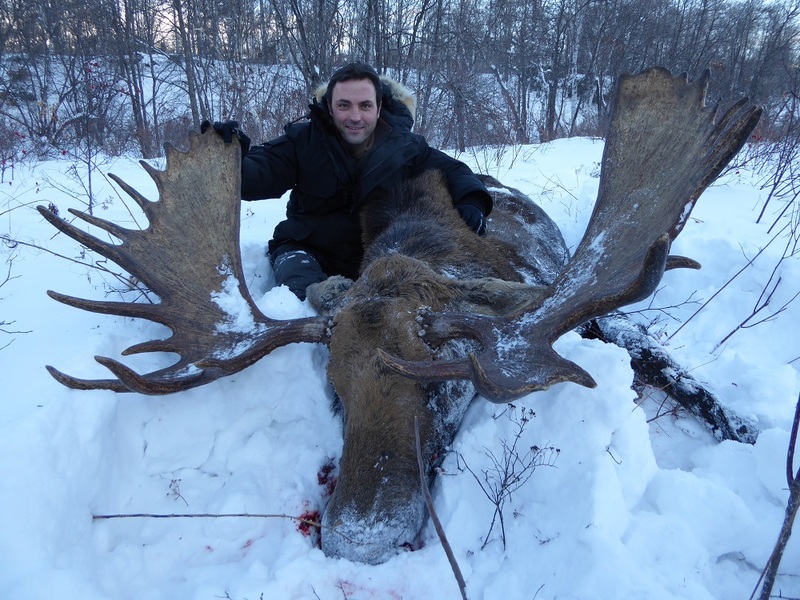 The hunting method is very similiar to the bear in the spring, you find a moose track and you follow it until you find it, if its big enough you shoot it. 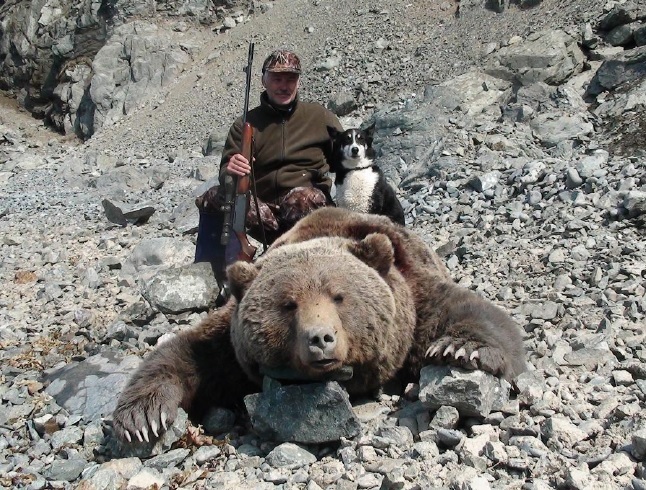 It is possible to combine it with bear (it is not rear to find one out of the cave) and with linx (there are many). 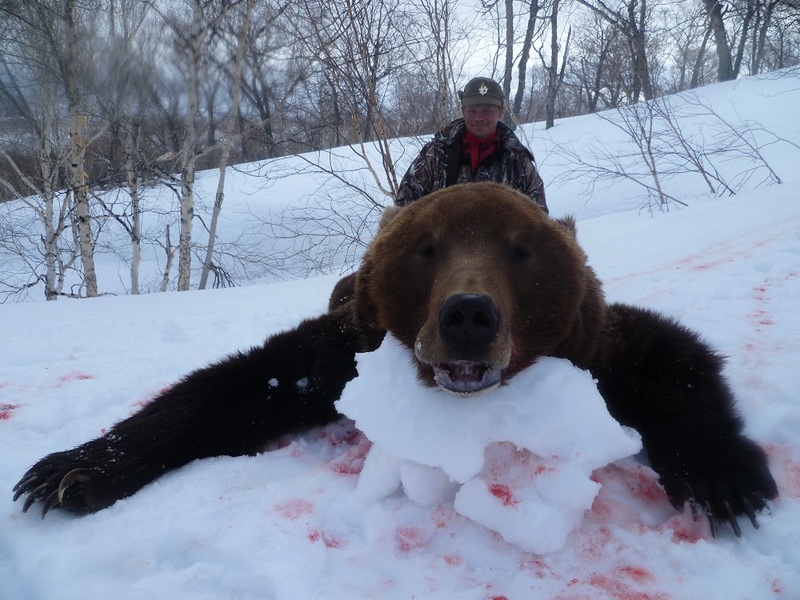 The success rate is close to 100%. 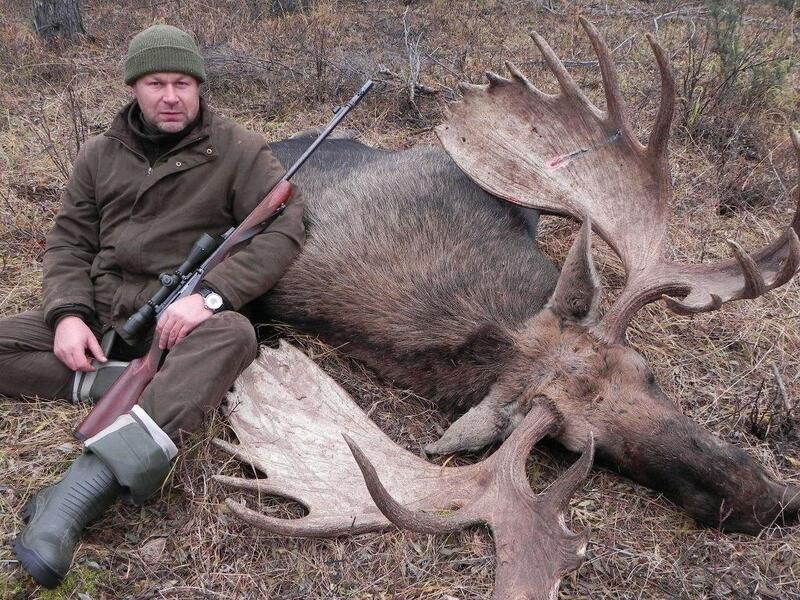 European moose: it is the most common one, and it is smaller than the one of Kamchatka. 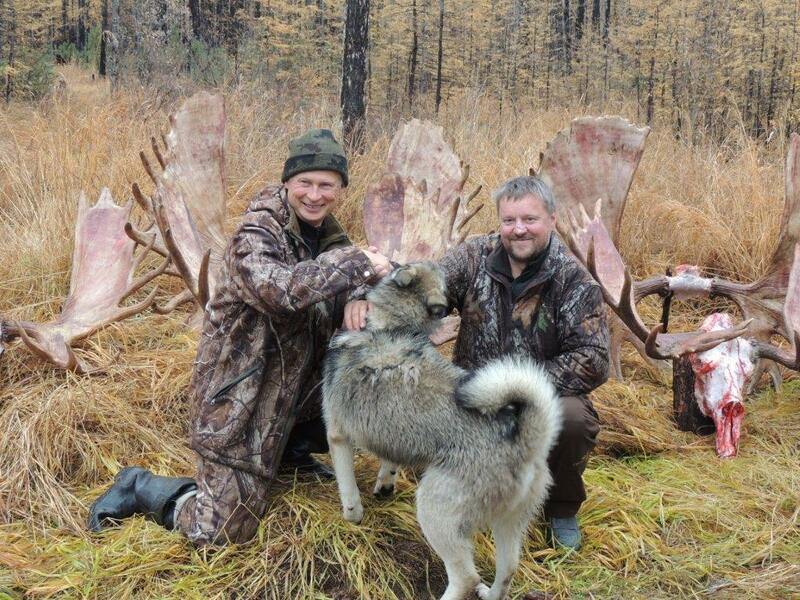 The best population is found in the west of Russia but the biggest trophies are found in the Liberia and Ural regions. 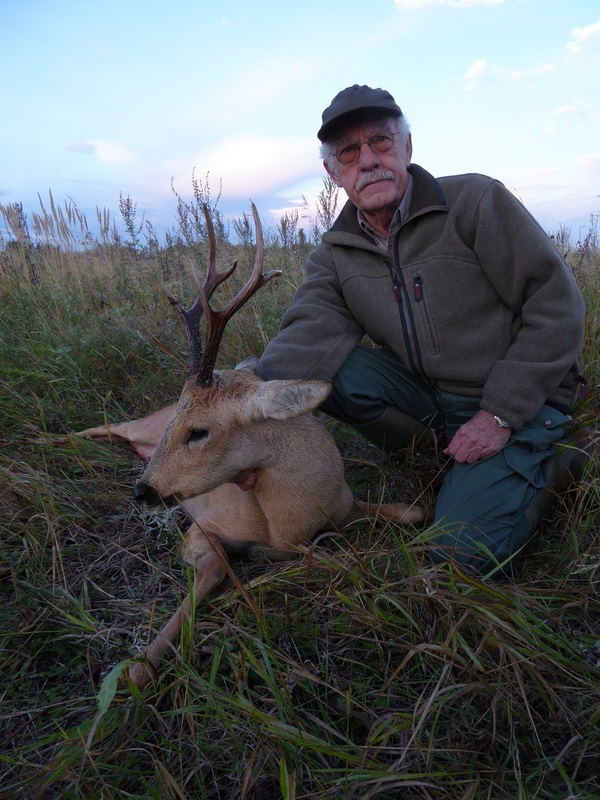 The hunt is done by calling them during the rut season or driving around with the car in the areas where there are roads. 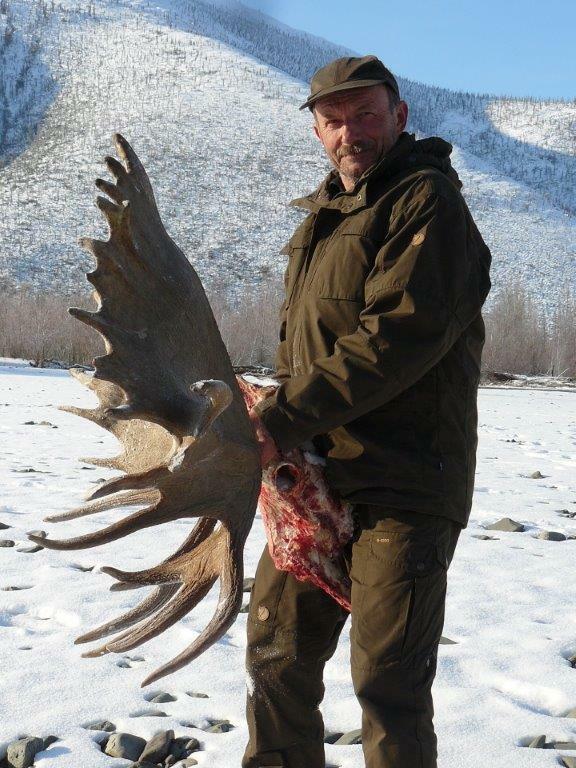 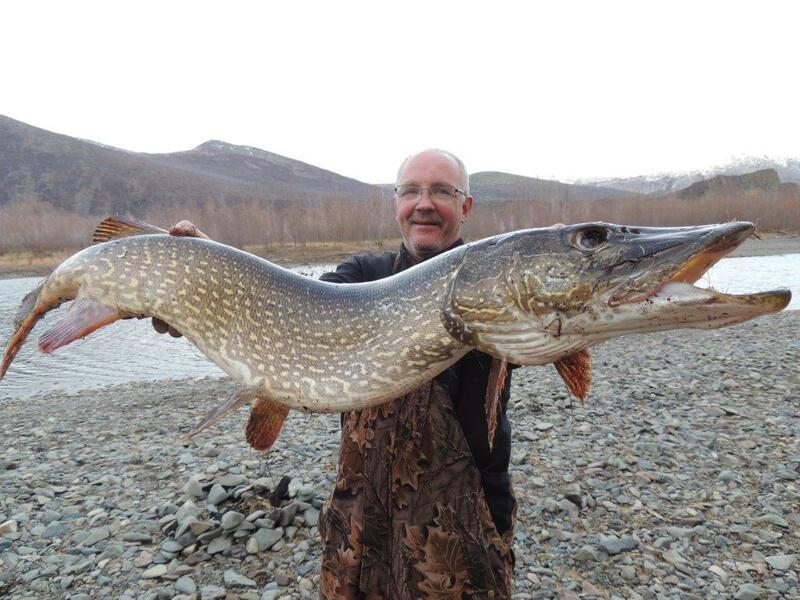 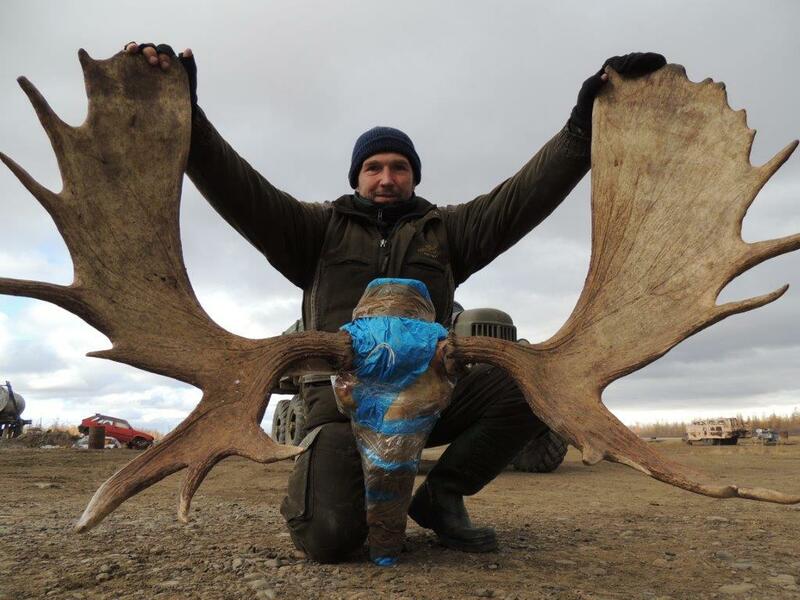 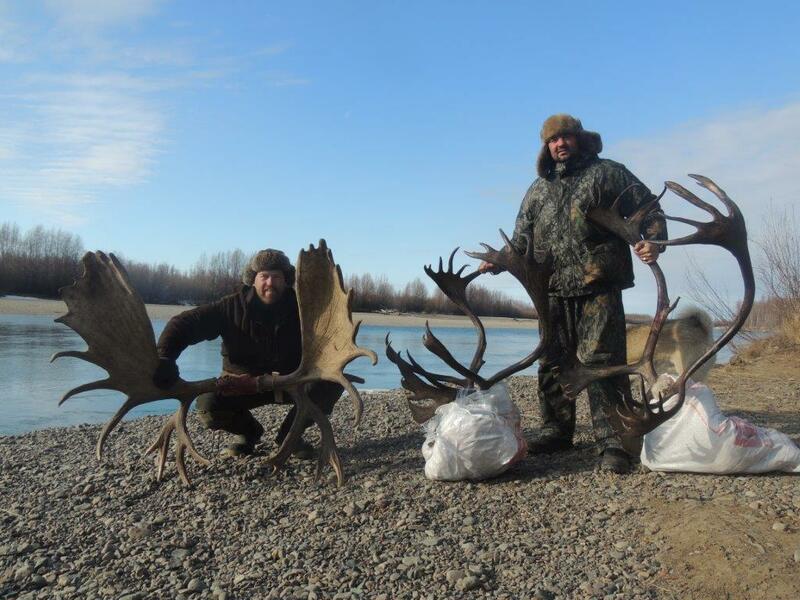 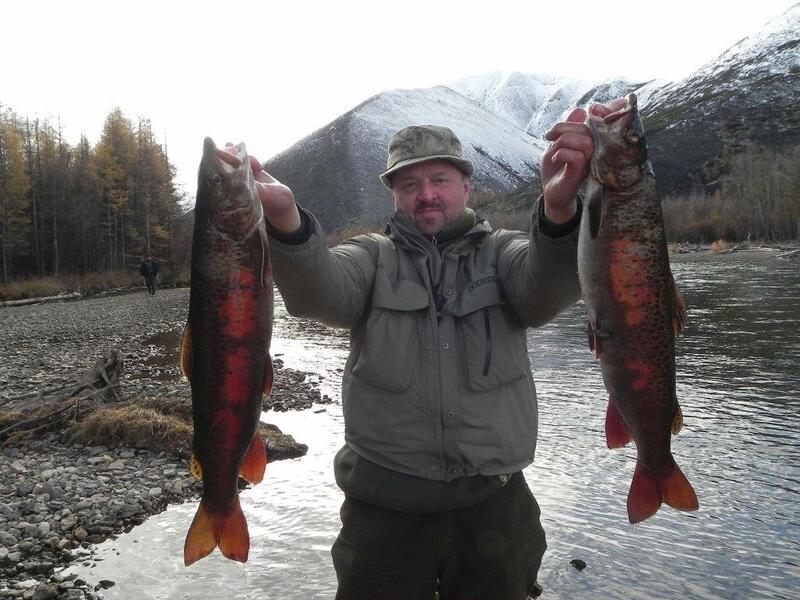 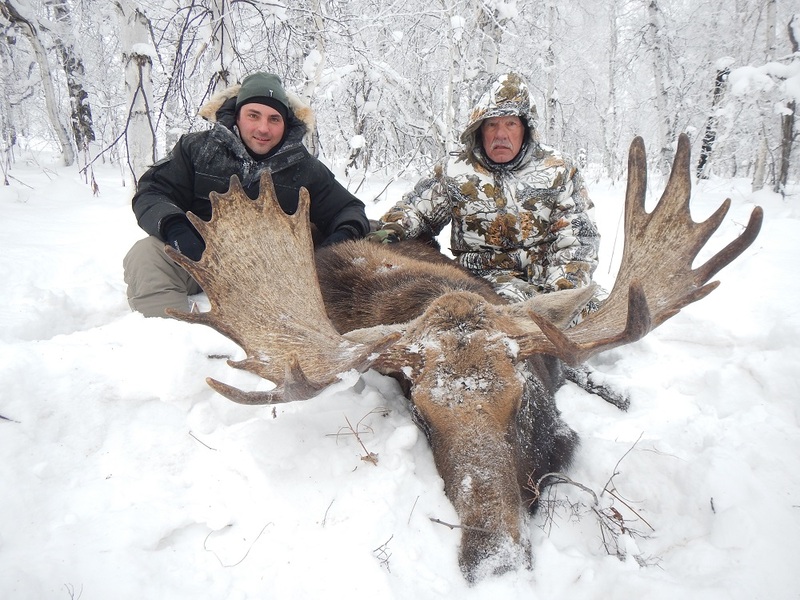 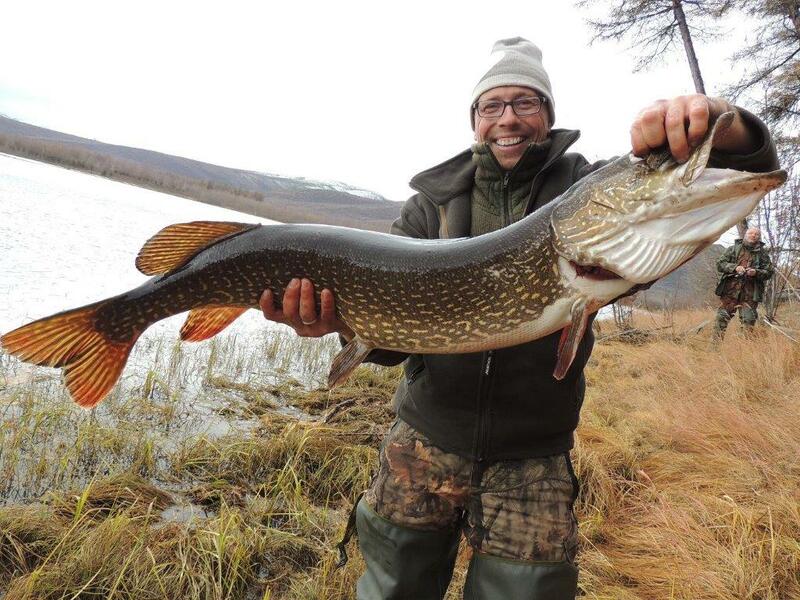 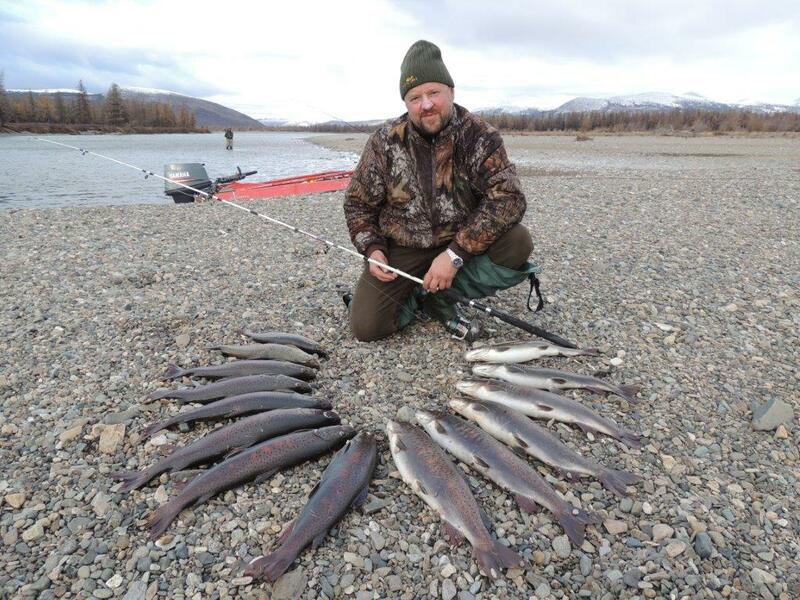 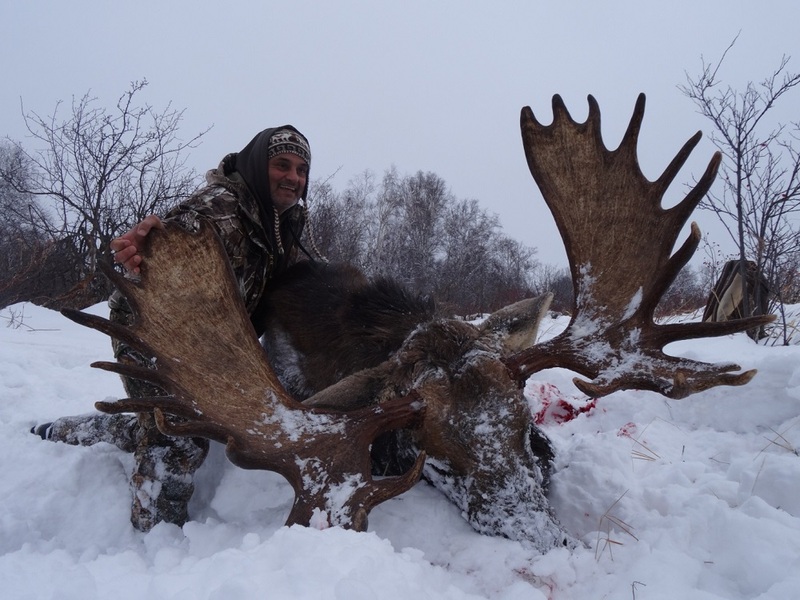 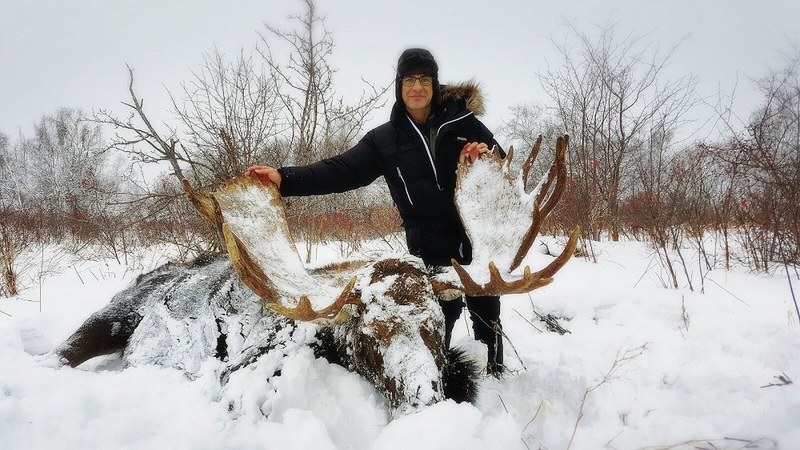 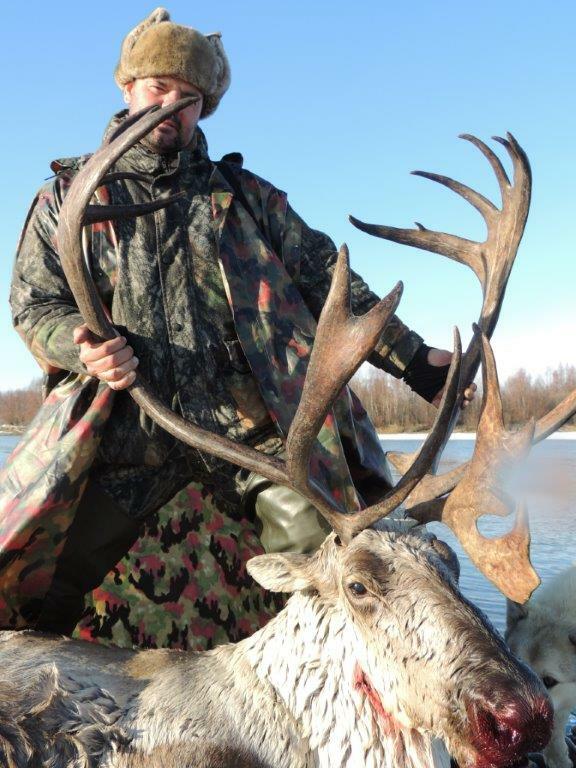 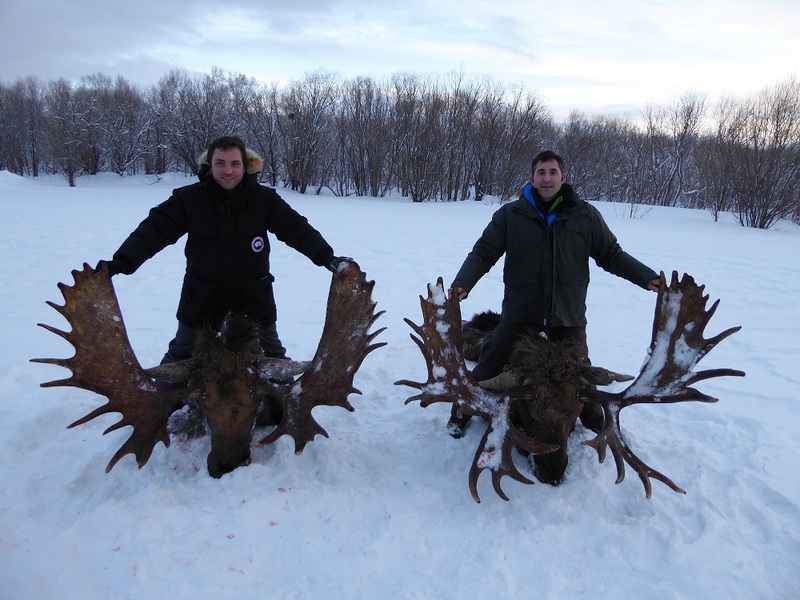 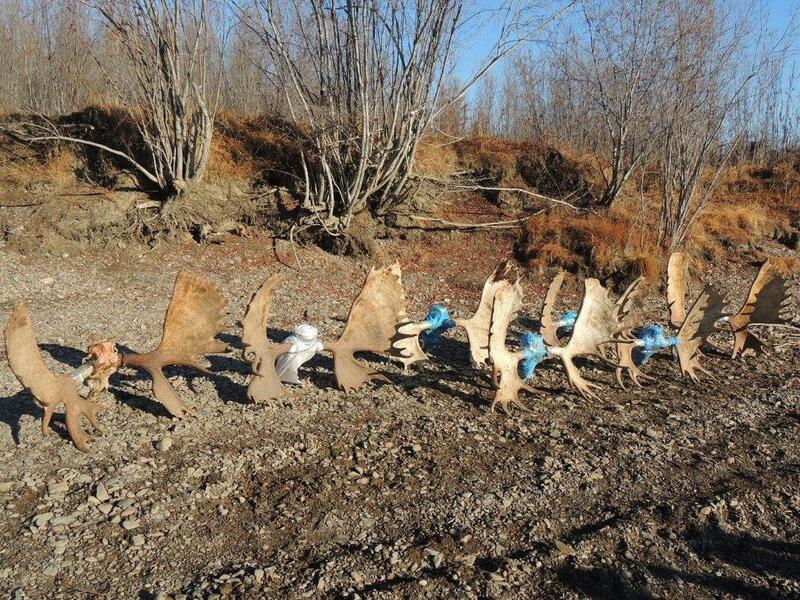 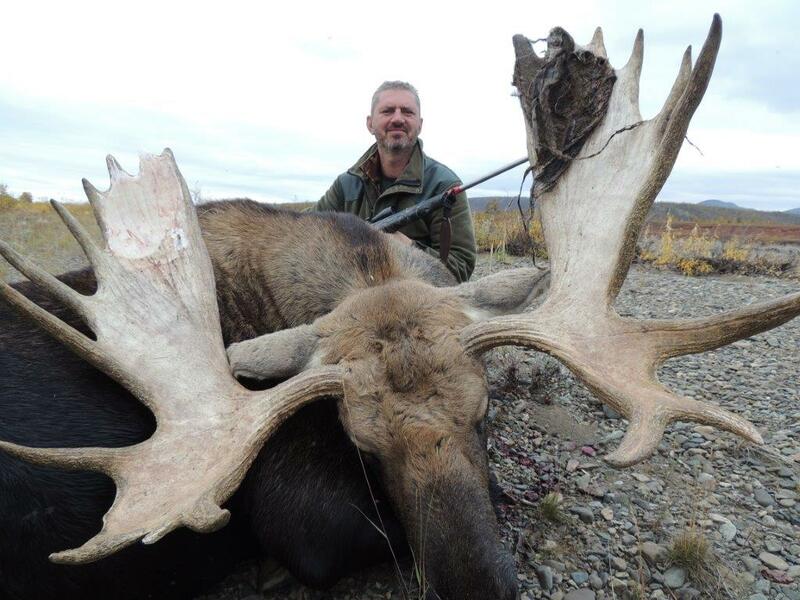 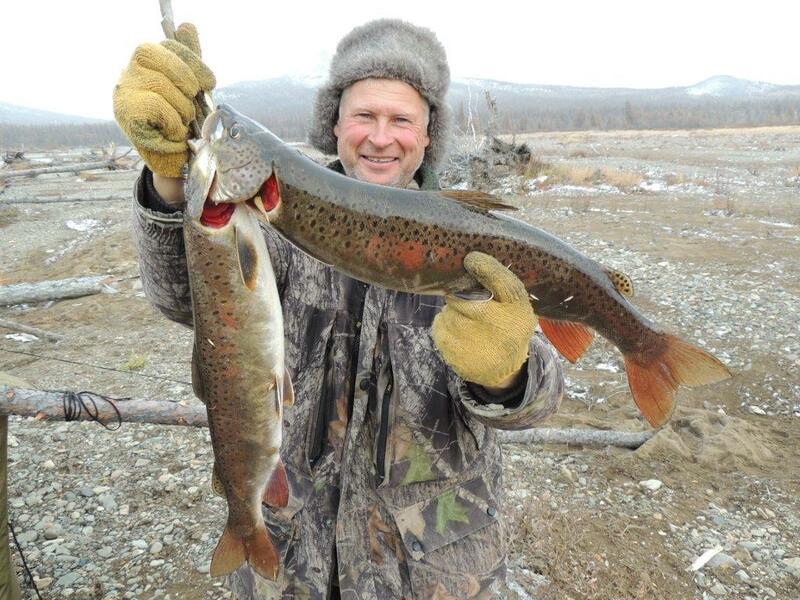 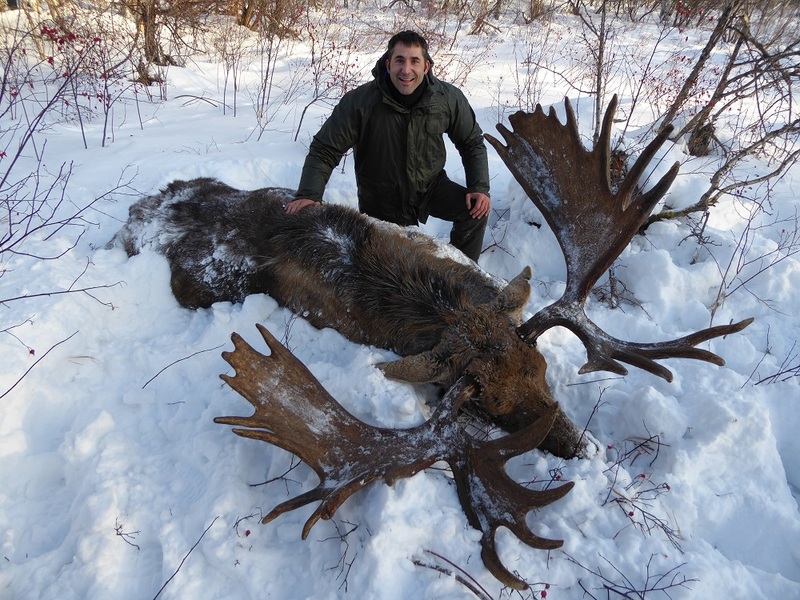 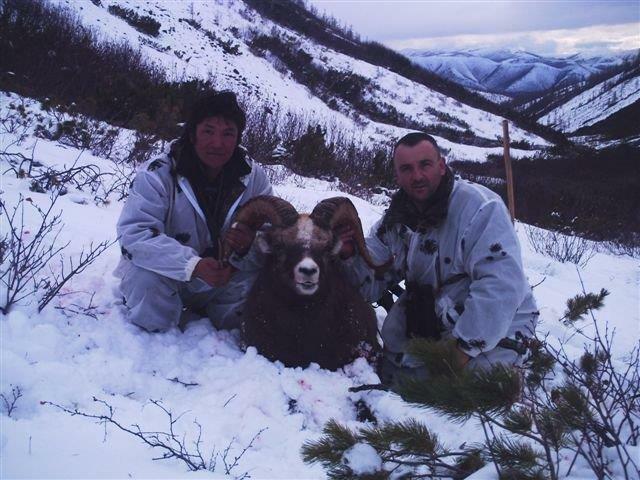 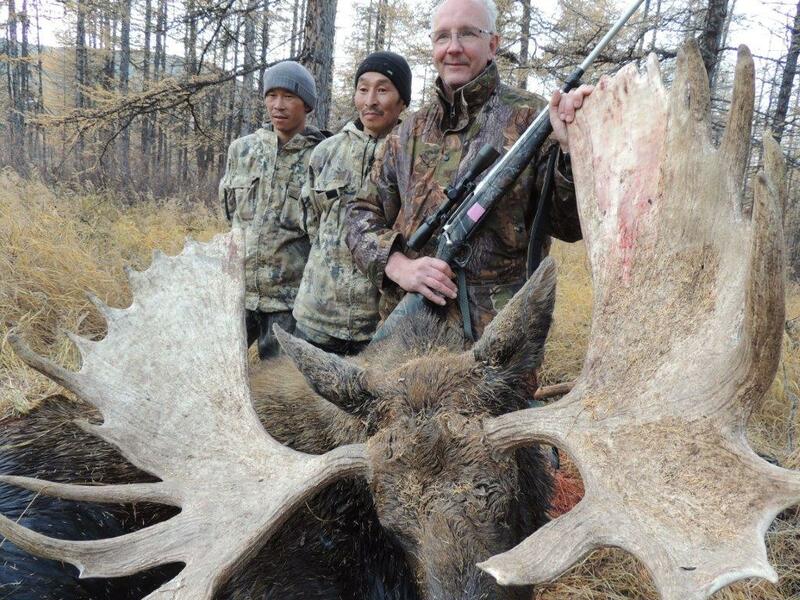 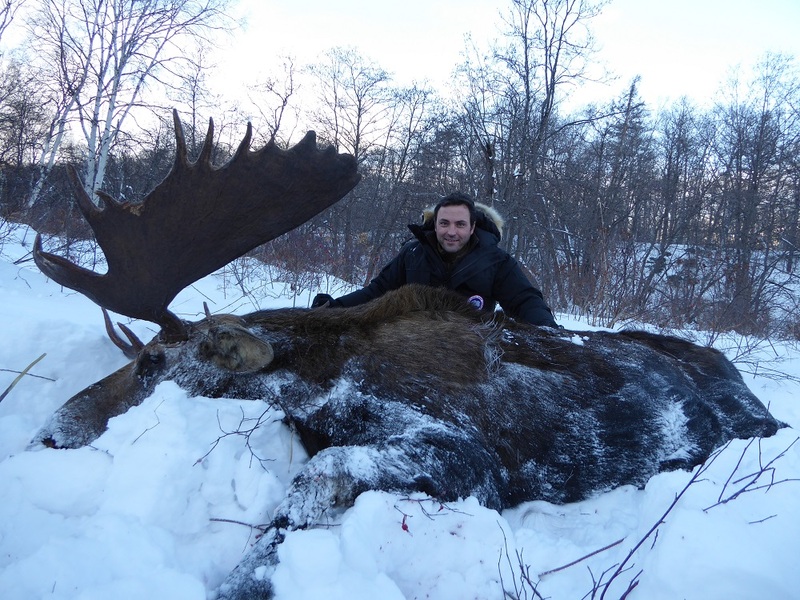 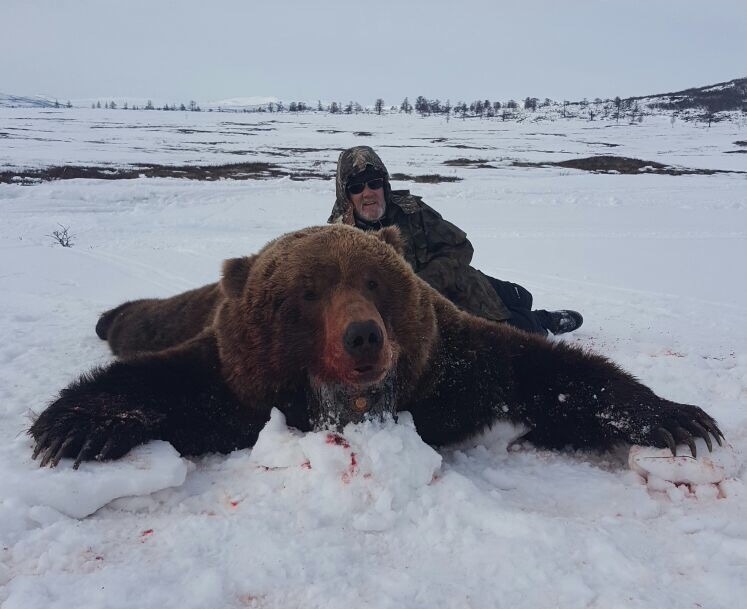 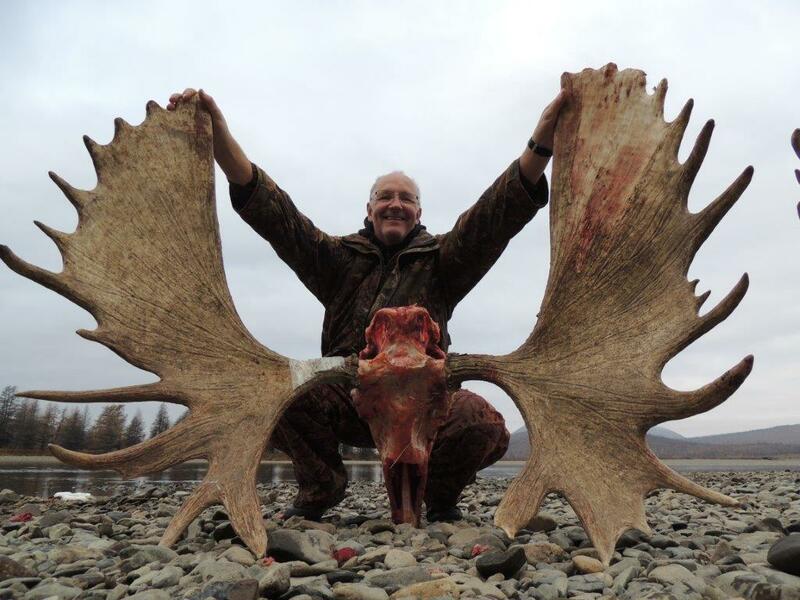 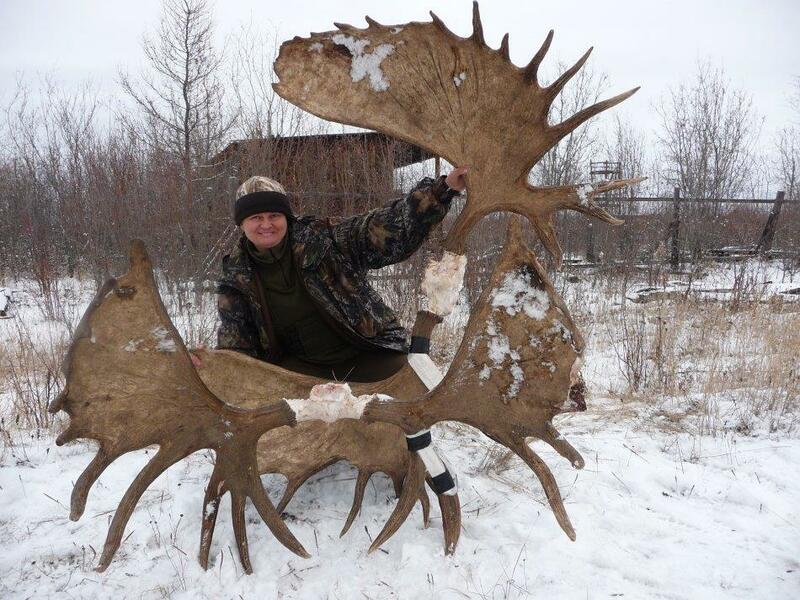 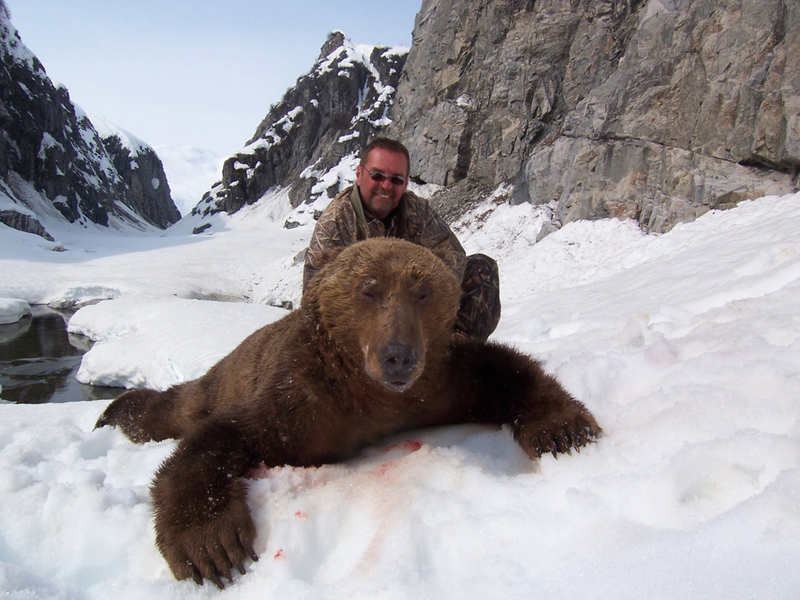 In Kamchatka and Magadan we get the biggest trophies with an average of 9 feet and every season some of 10 feet are hunted. 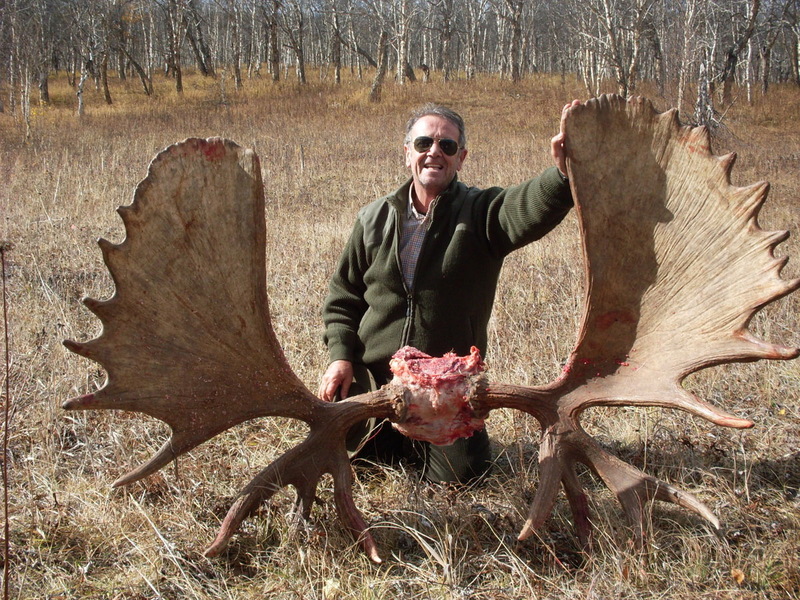 It can be hunted in the spring, fall and winter. 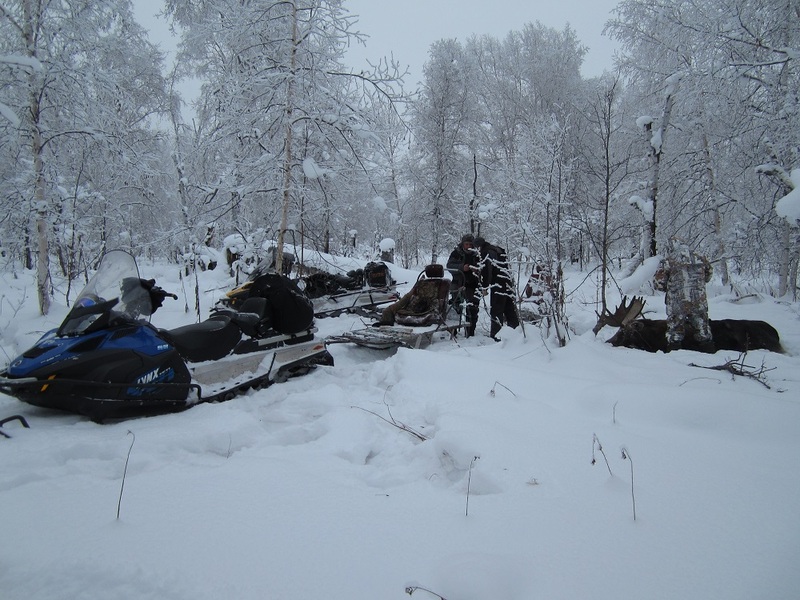 The best season is during the spring, we use snowmobiles to hunted by following their tracks, you can easily see 10-20 bears per day. 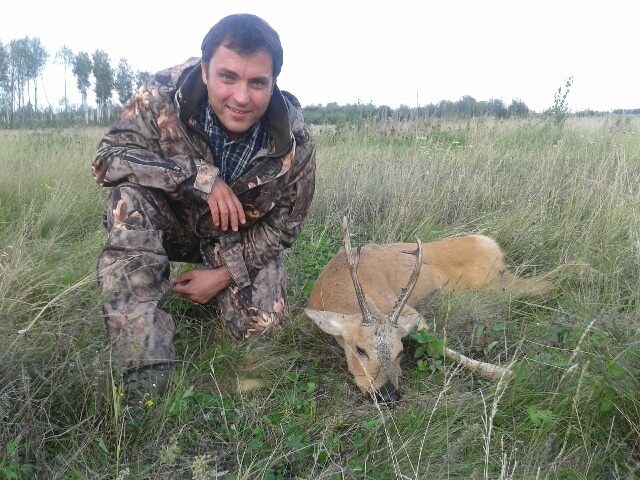 The succes rate is close to 100%. 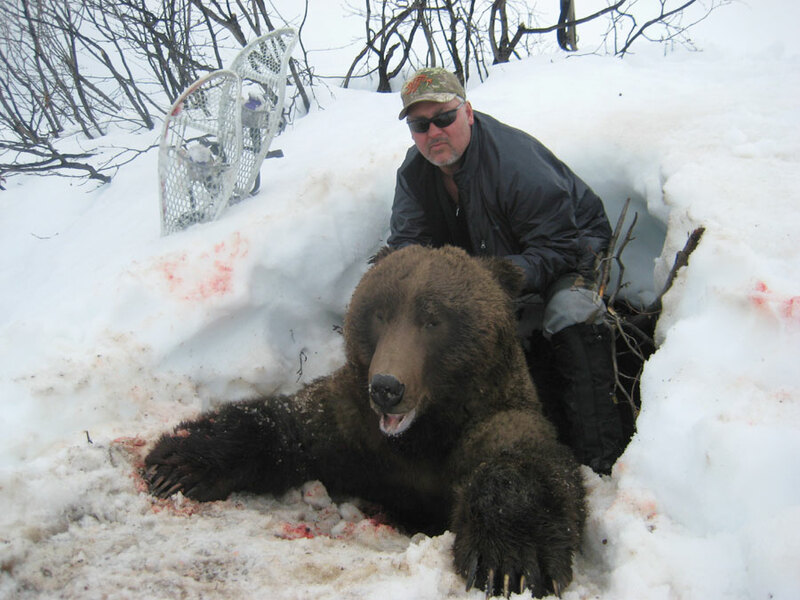 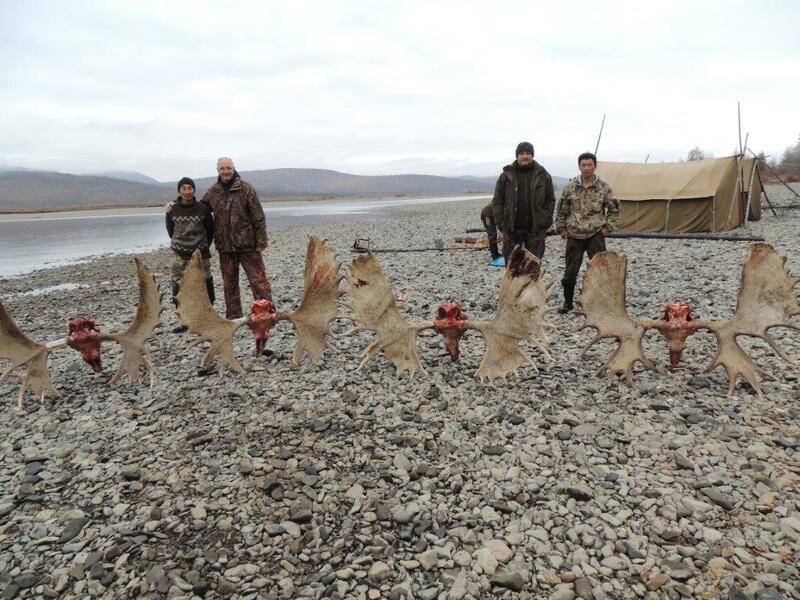 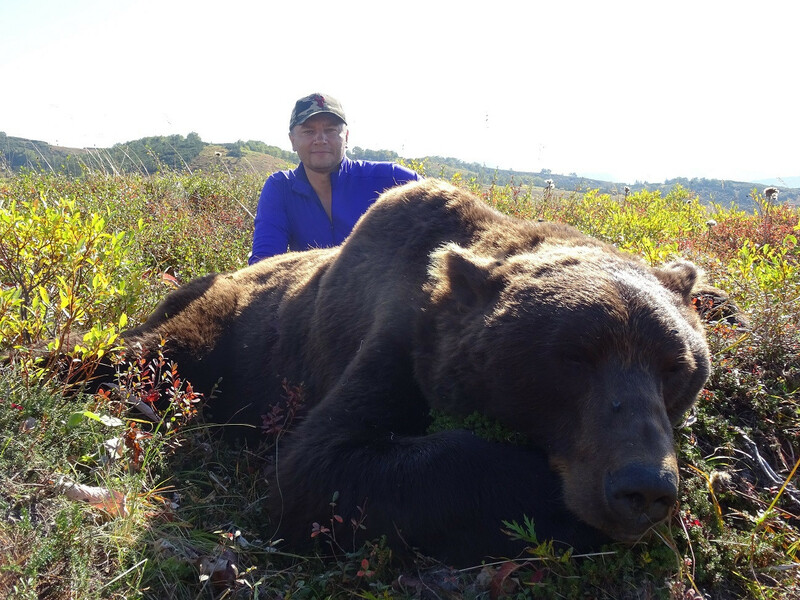 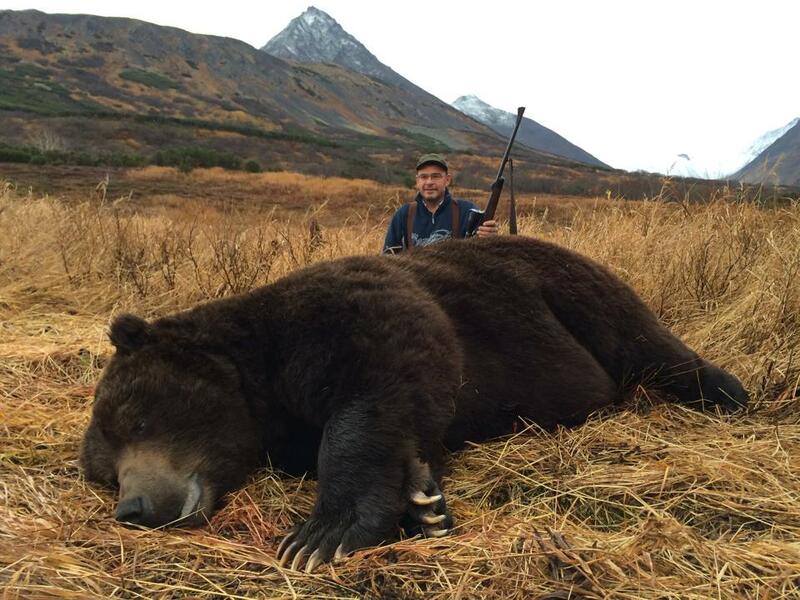 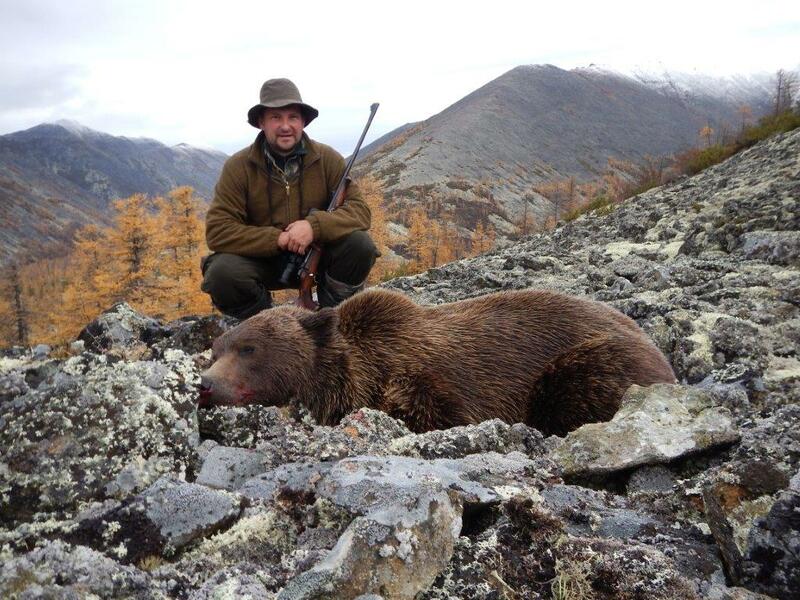 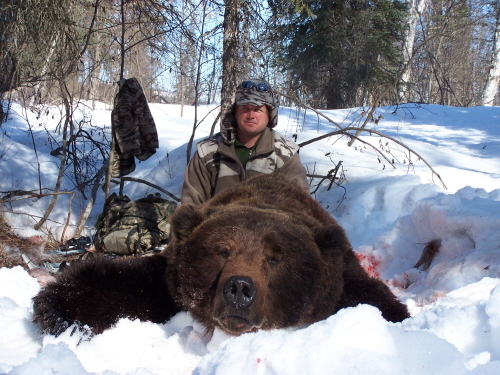 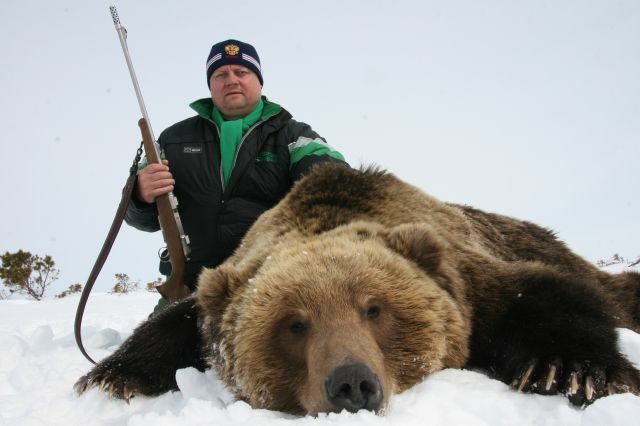 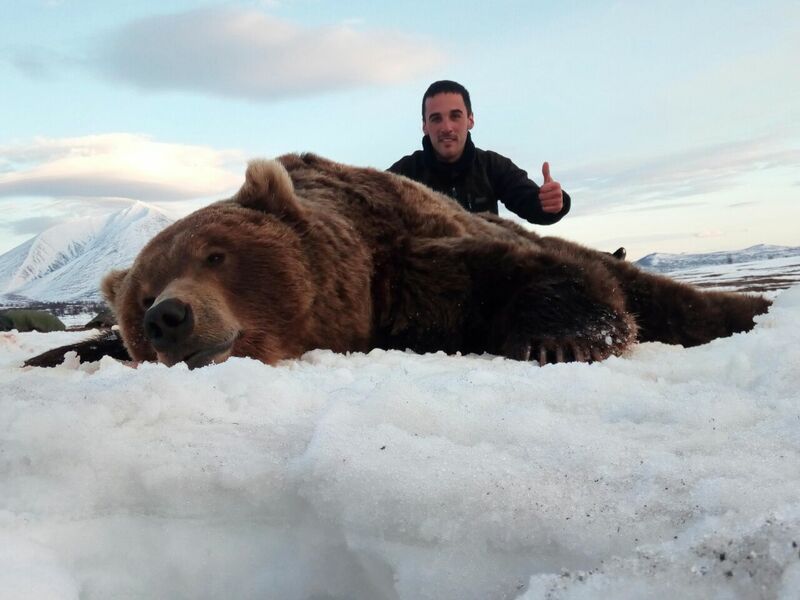 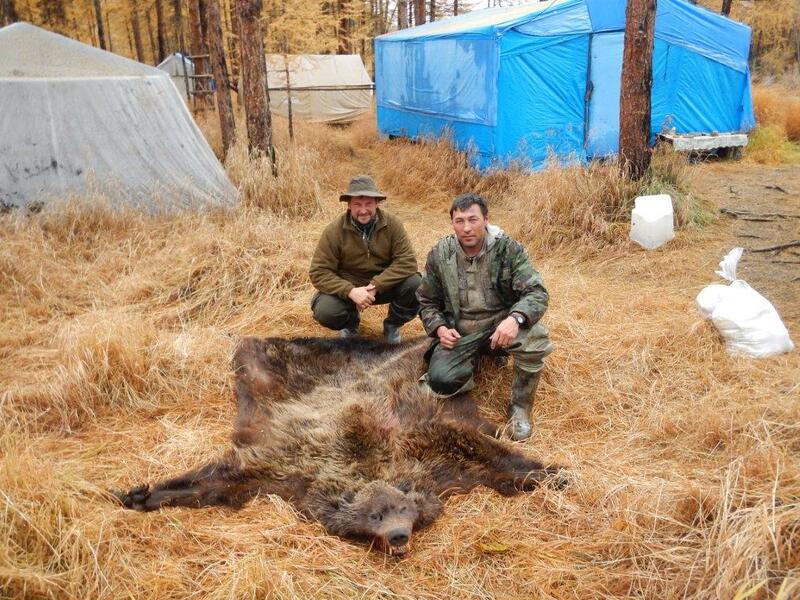 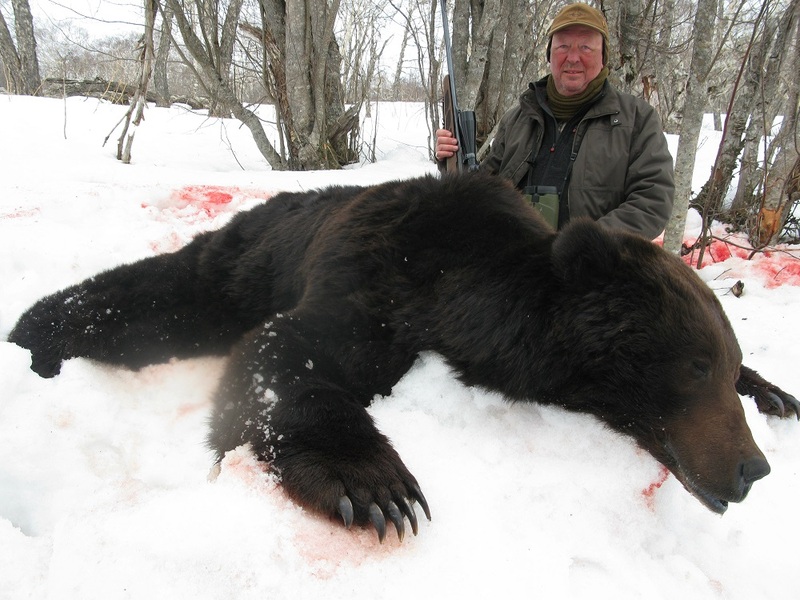 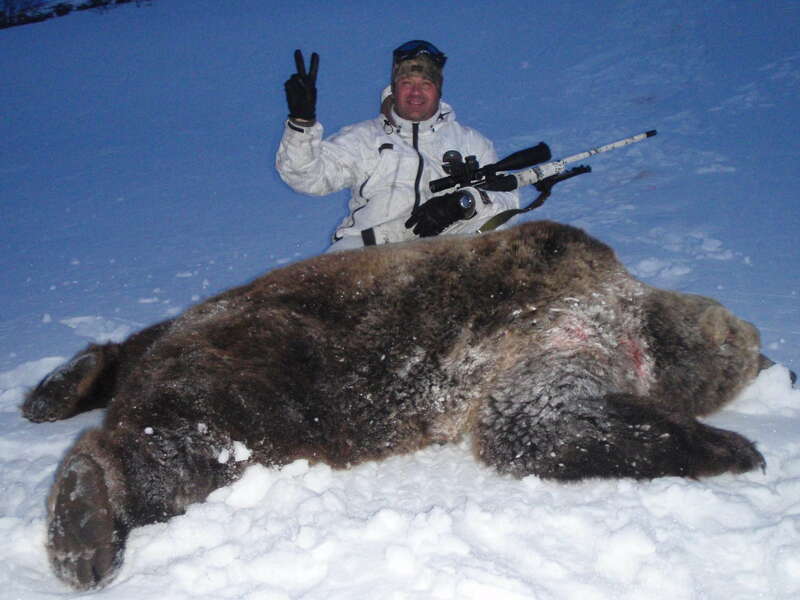 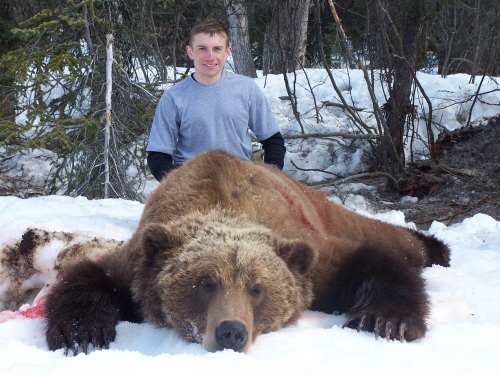 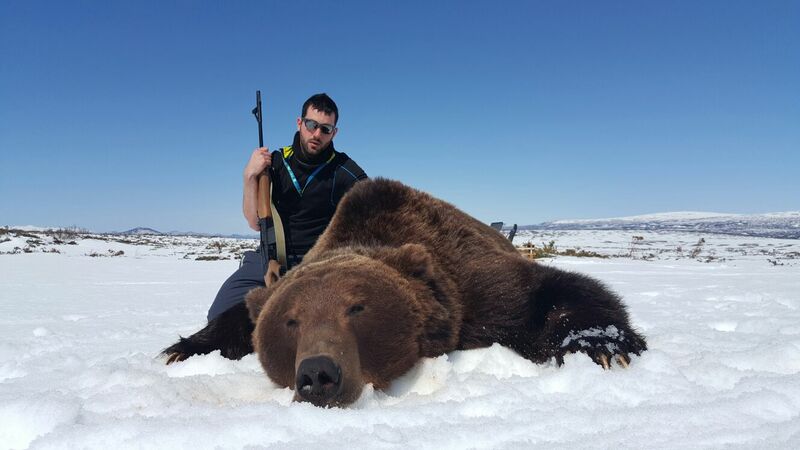 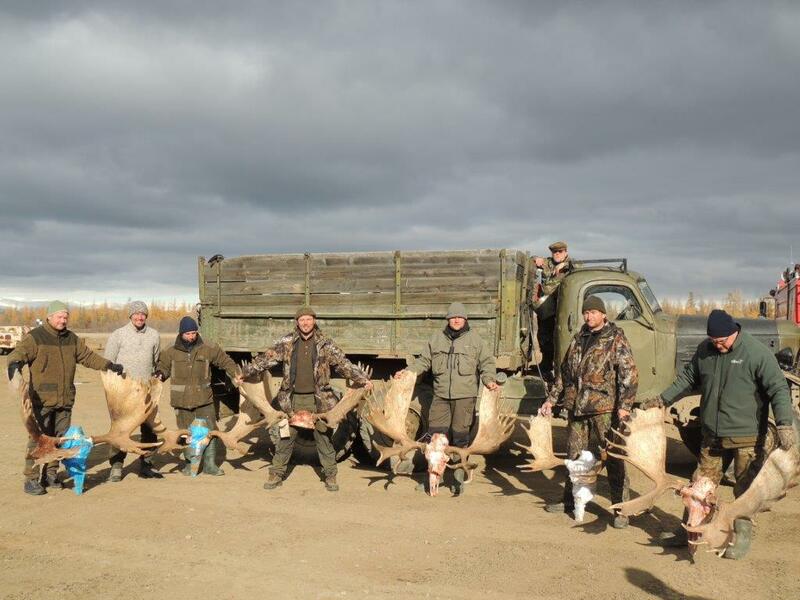 Euroasian bear: it is hunted in San Petersburg, Novgord, Vologda and Karelia. 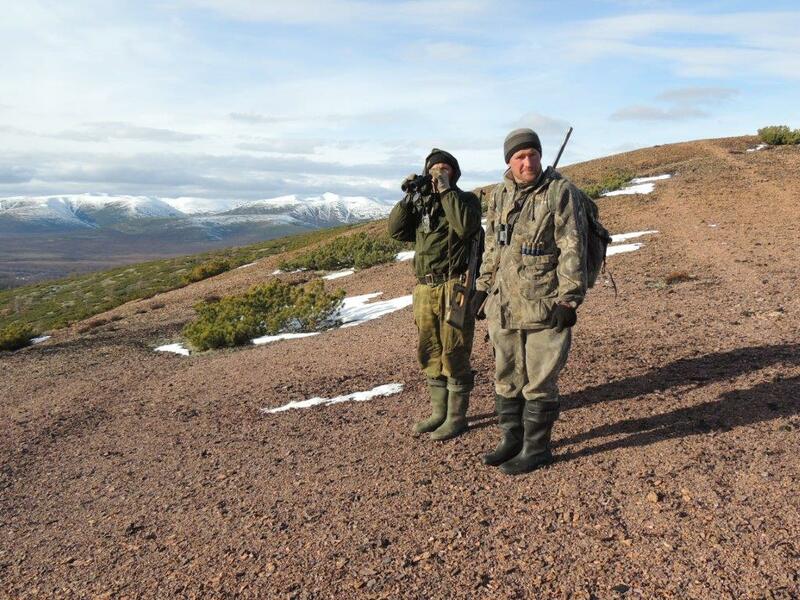 The hunting method it is mainly by waiting in feeding places although sometimes we can stalk them. 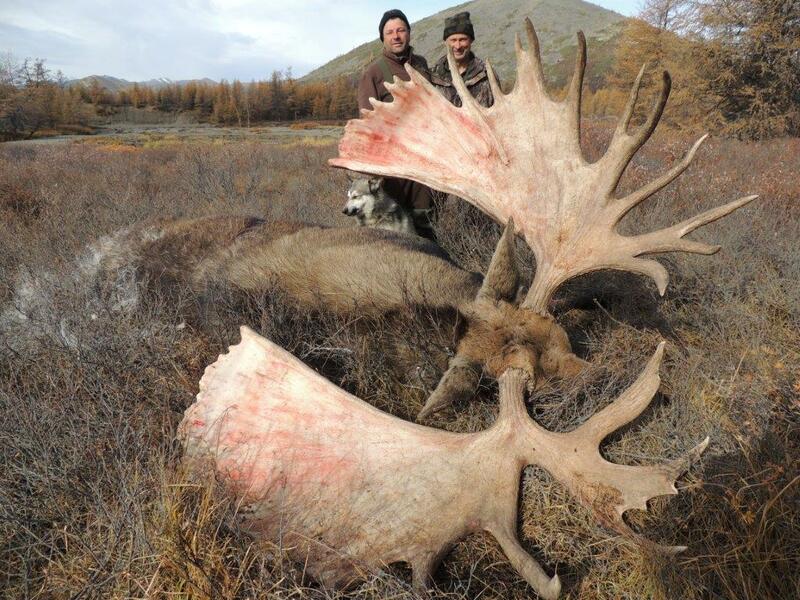 They can reach 7-8 feet and weight over 300 kg (600 pounds). 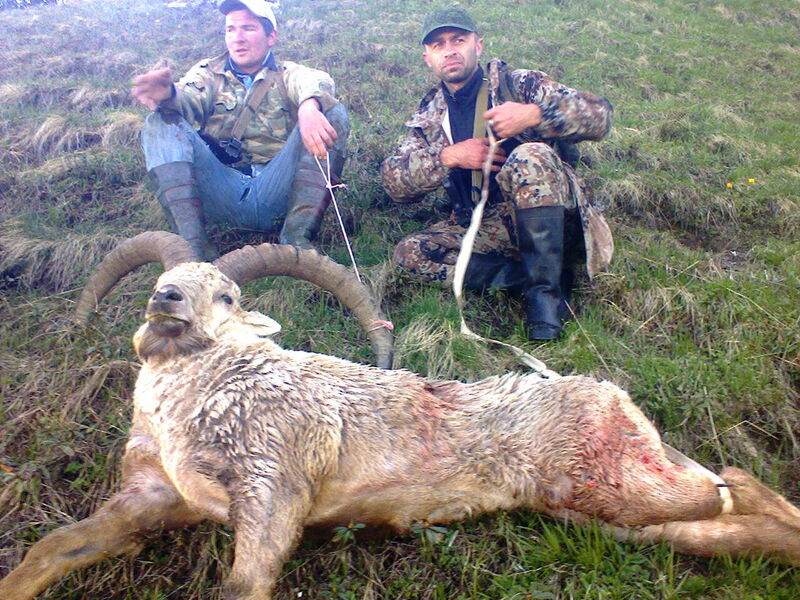 The hunting season is from November to February. 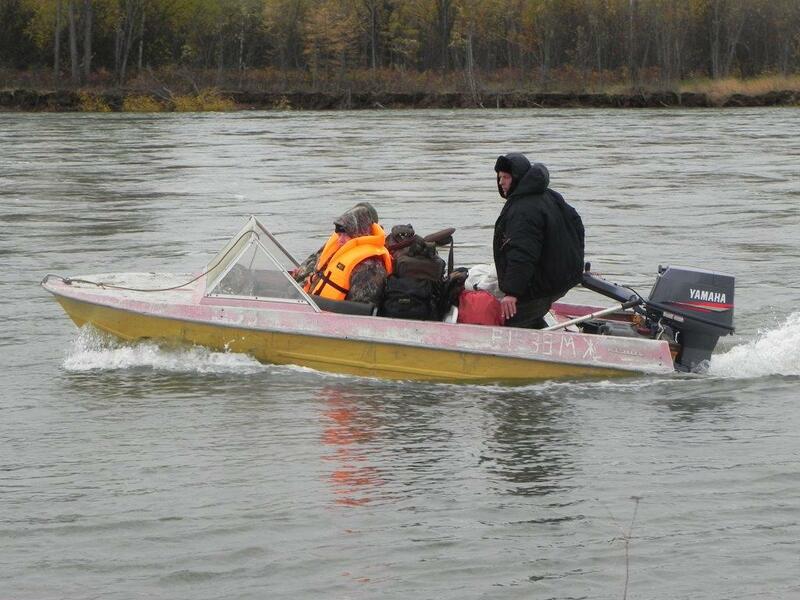 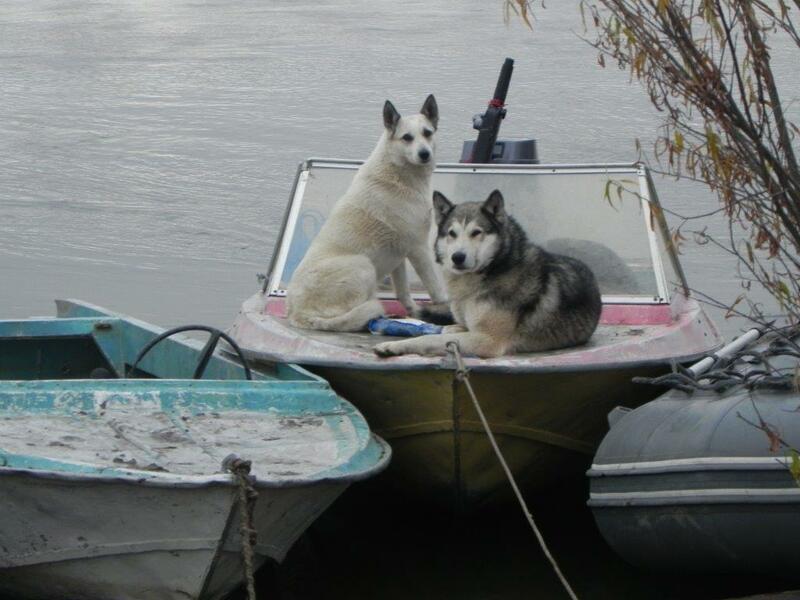 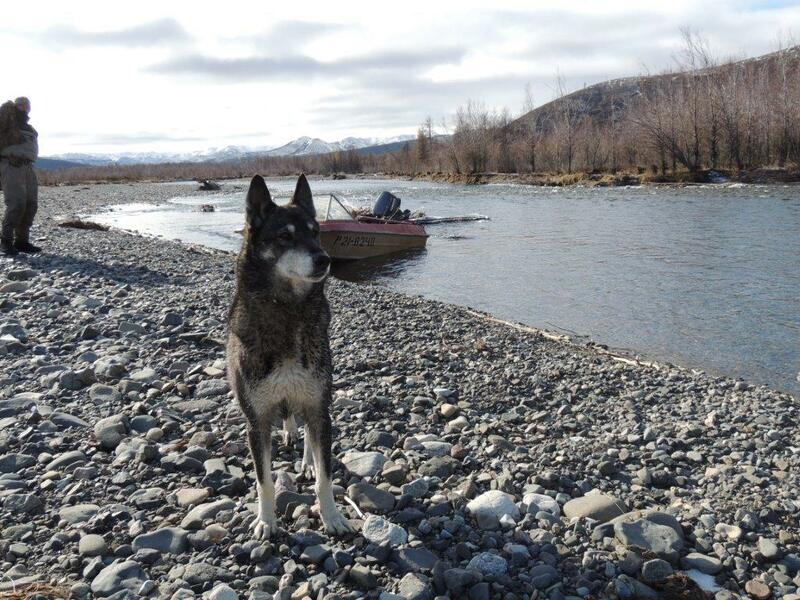 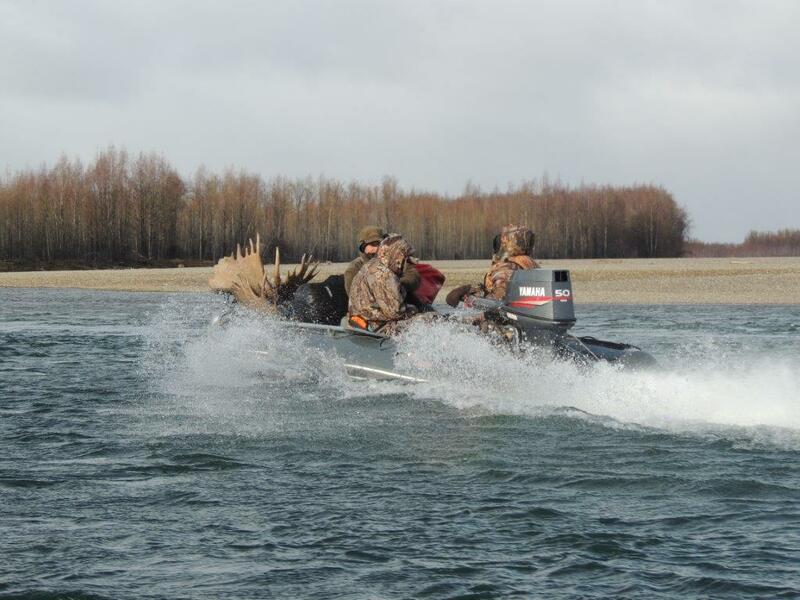 We follow its tracks with snowmobiles, also we use dogs to hunt them. 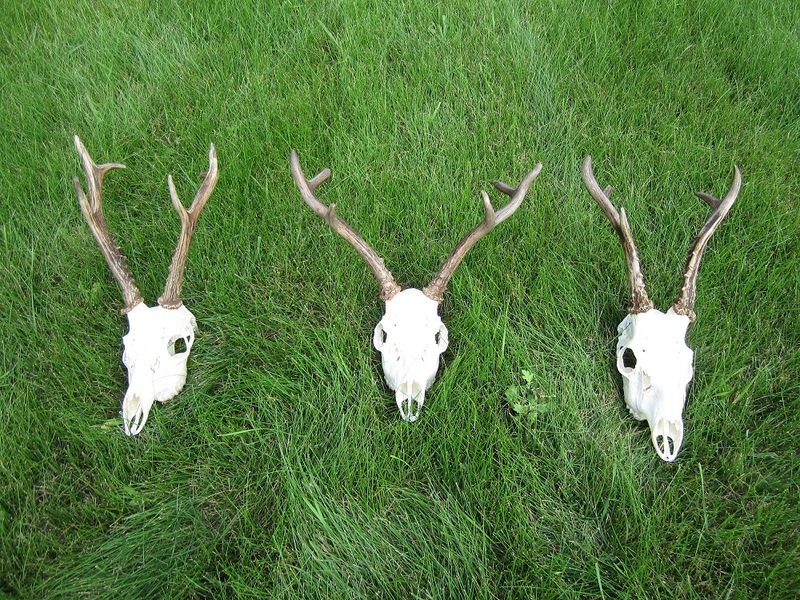 The success rate is close to 100%. 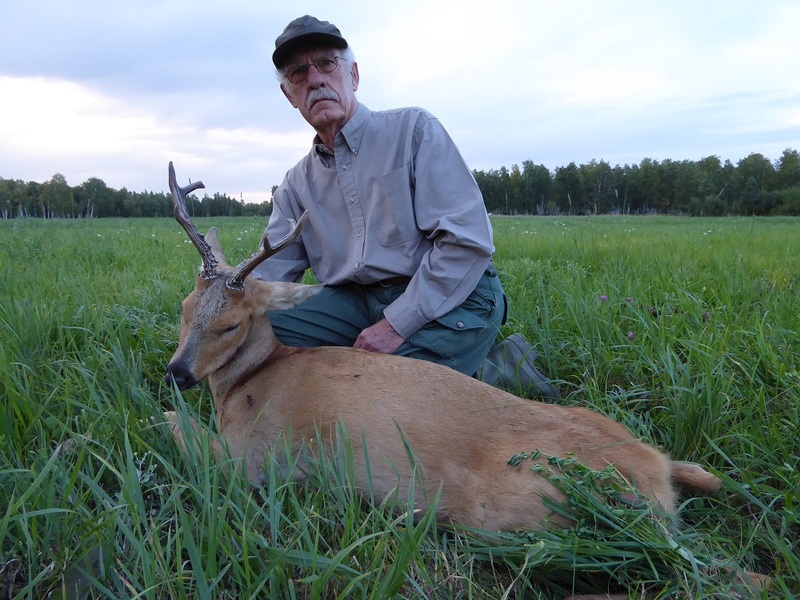 Among many other abundant game animals that can be found in Russia, one of the most graceful is Siberian Roe Deer which inhabits Kurgan and Chelyabinsk regions of Russia. 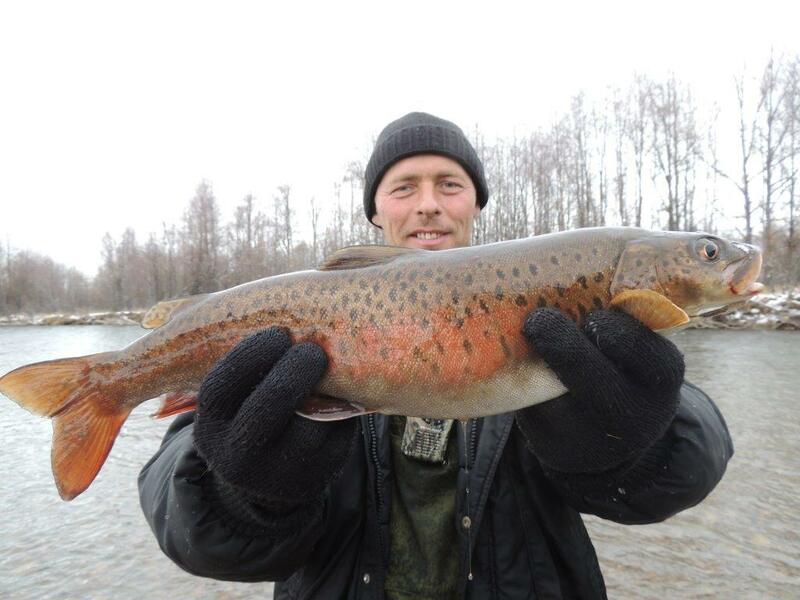 It is considerably larger specie than European roe. 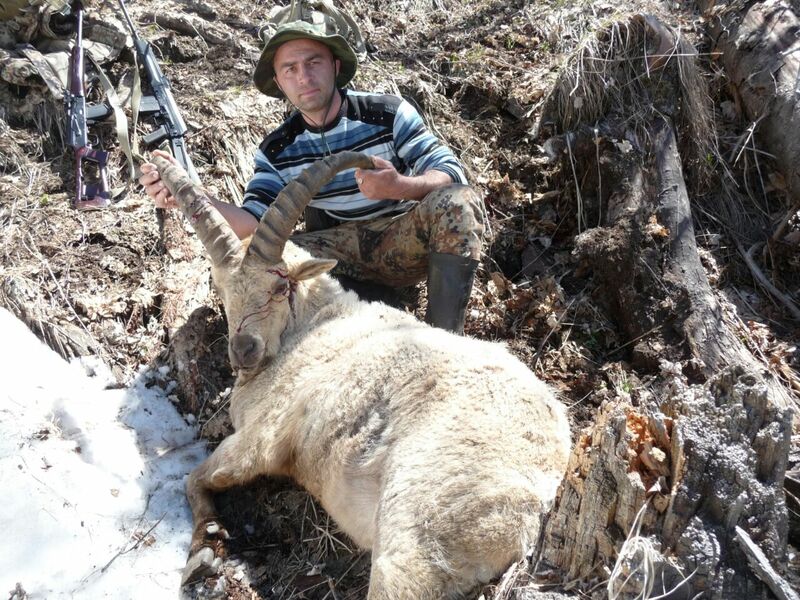 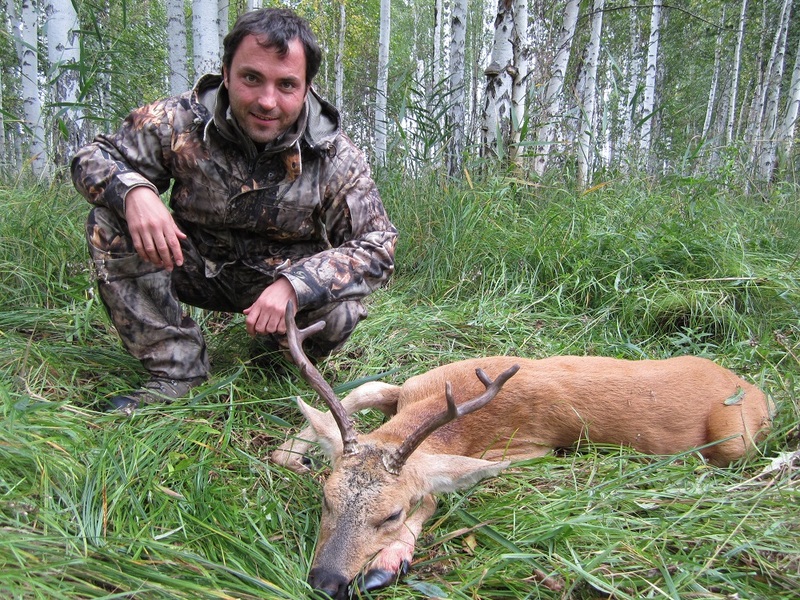 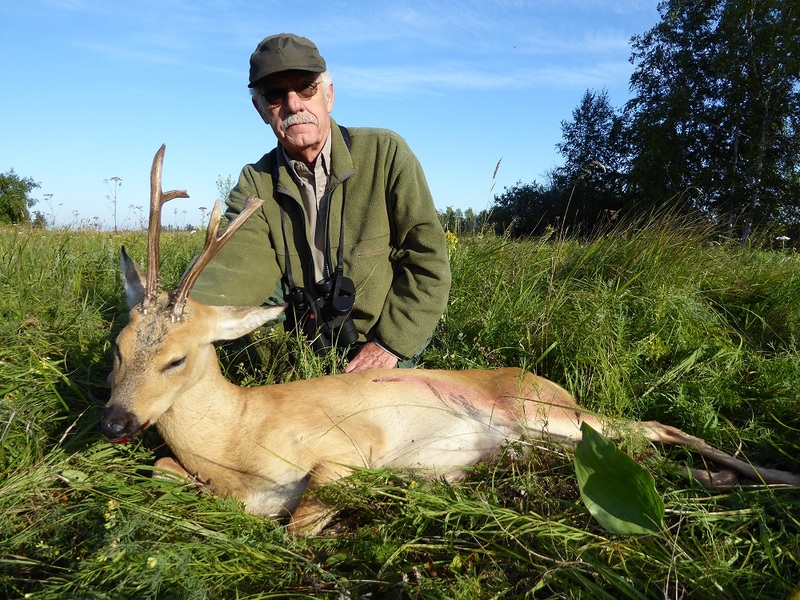 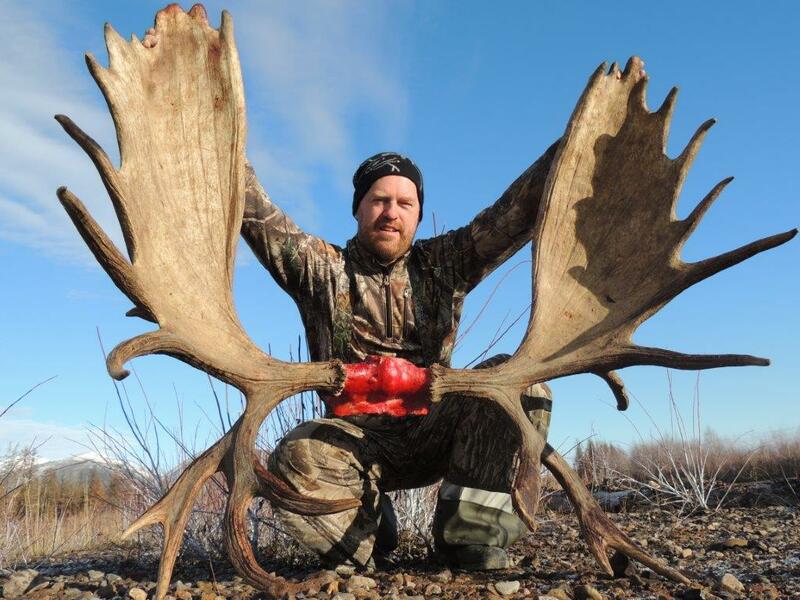 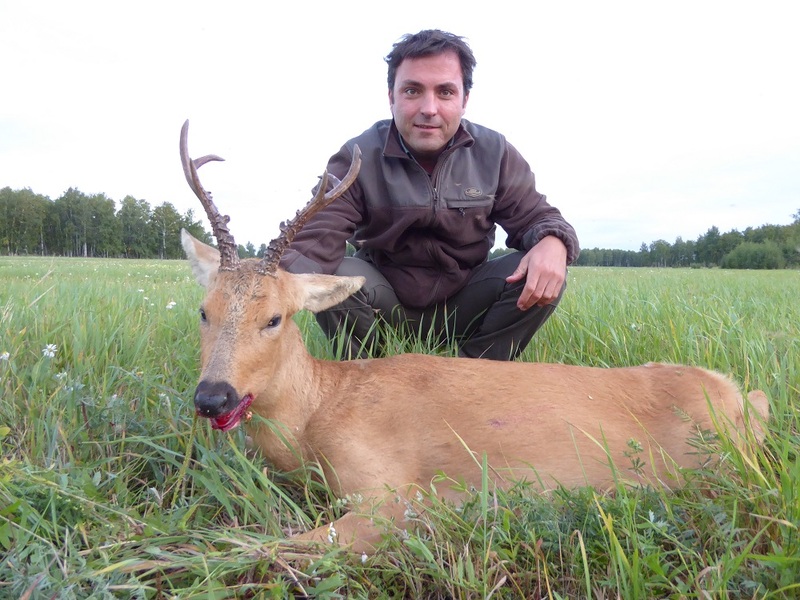 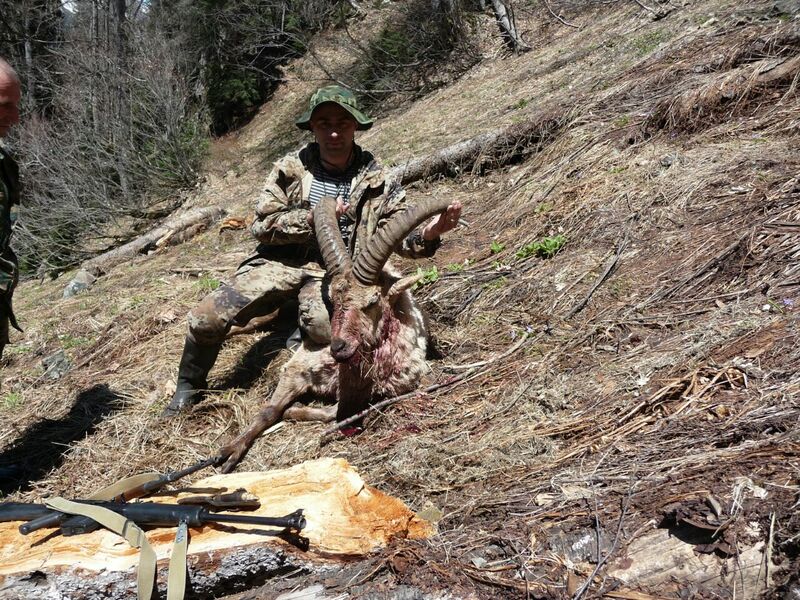 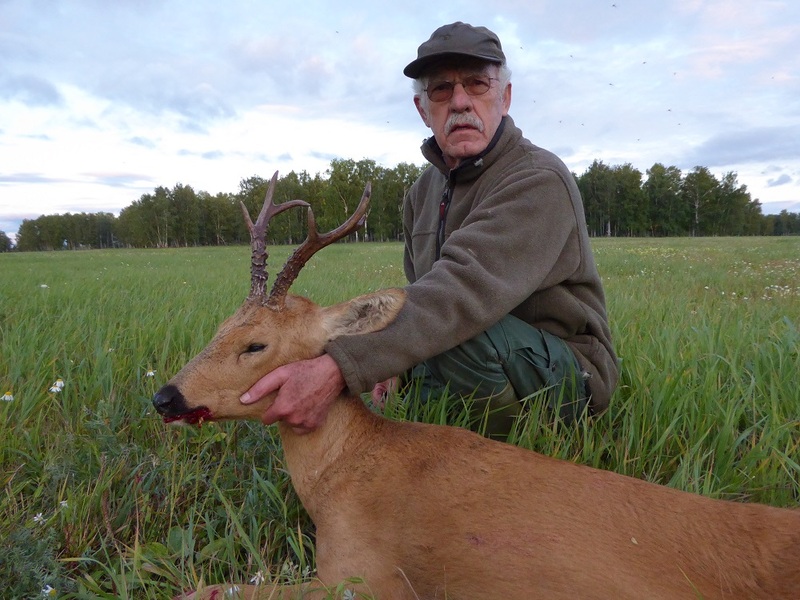 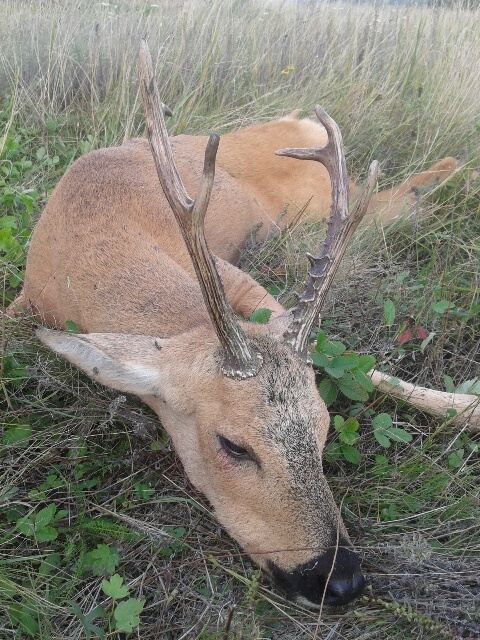 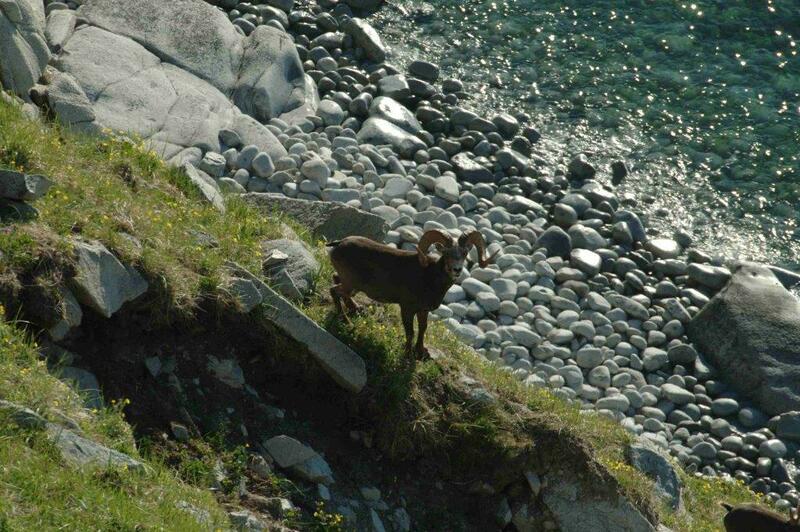 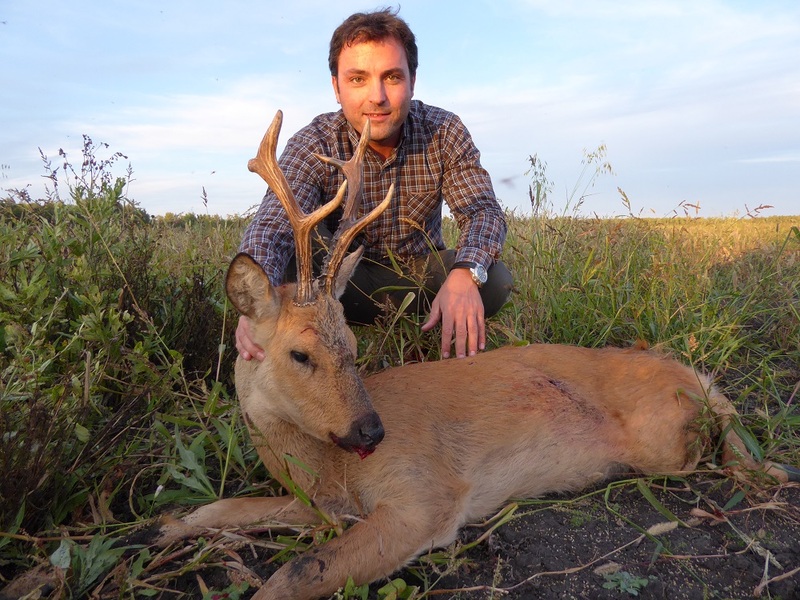 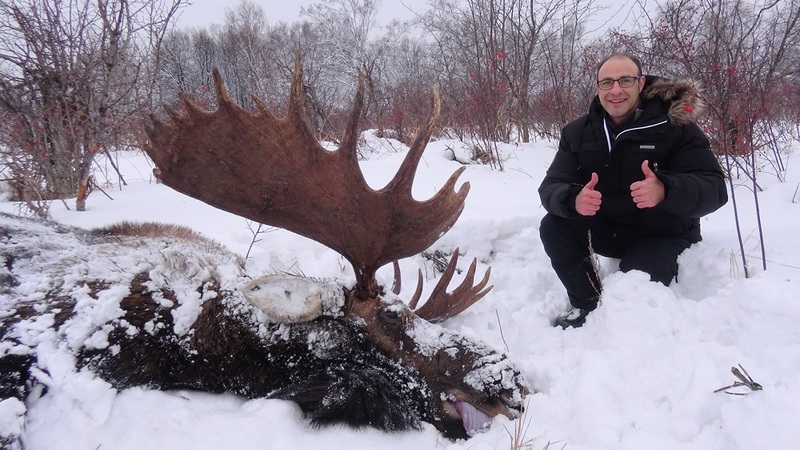 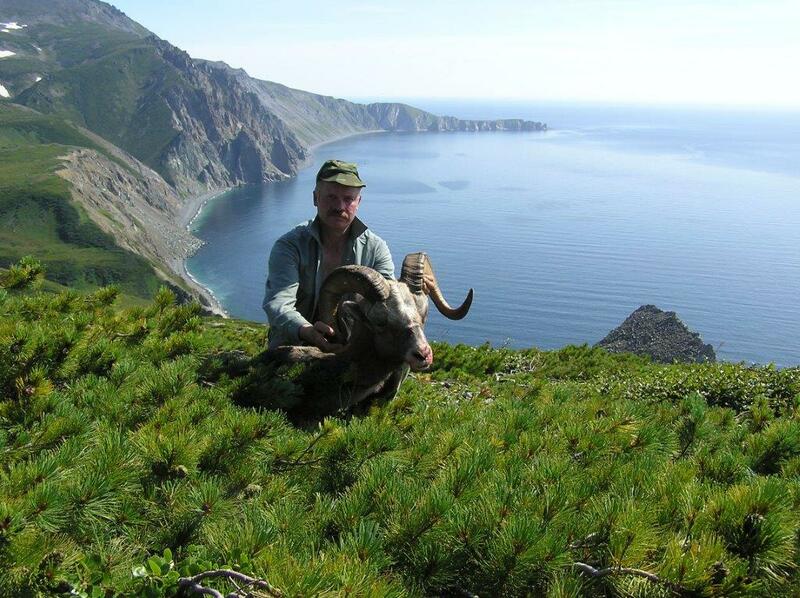 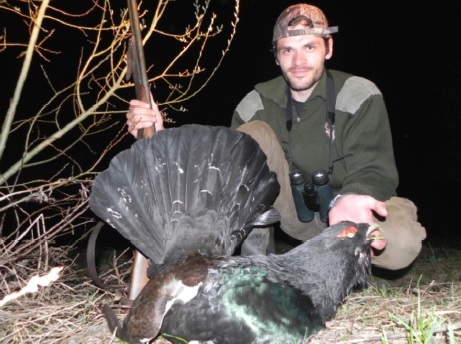 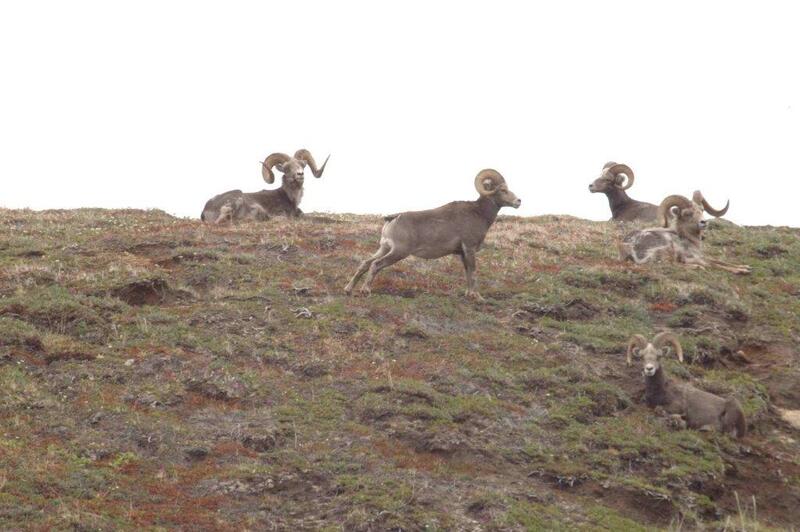 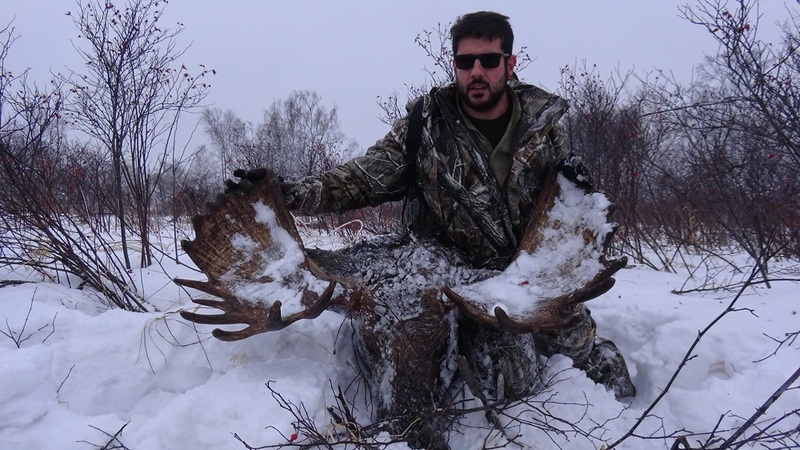 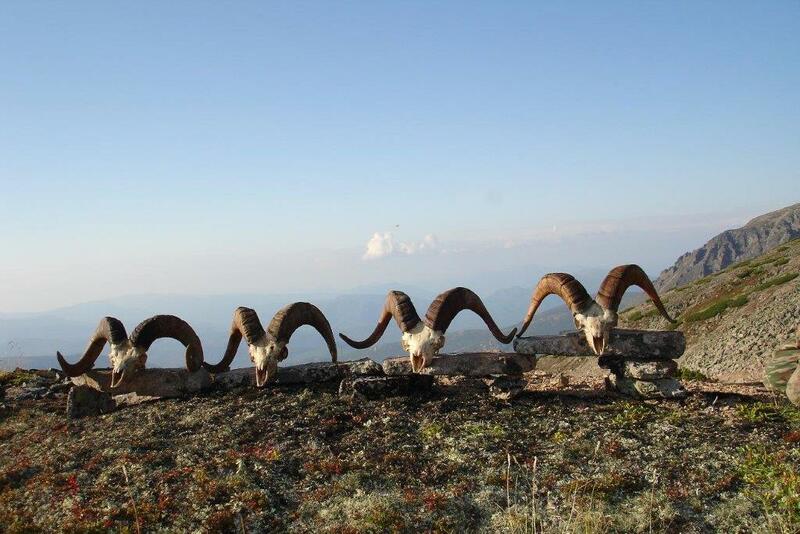 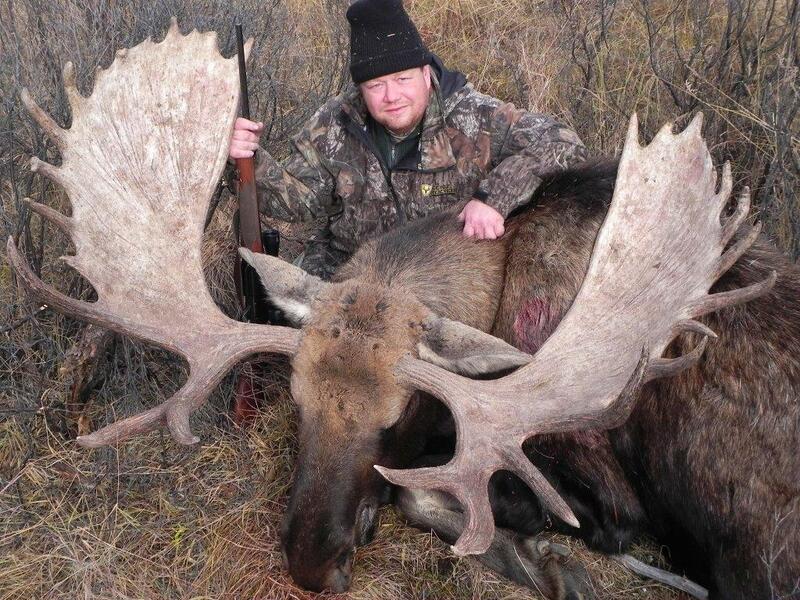 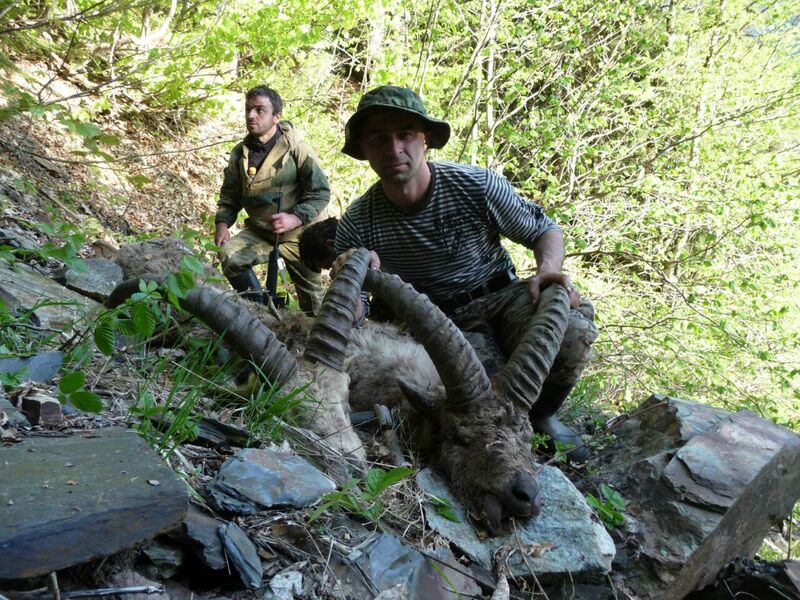 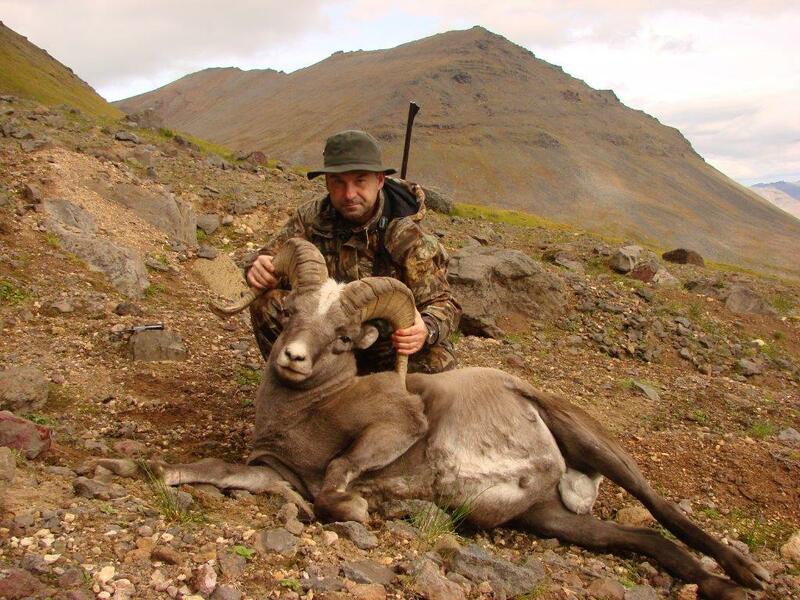 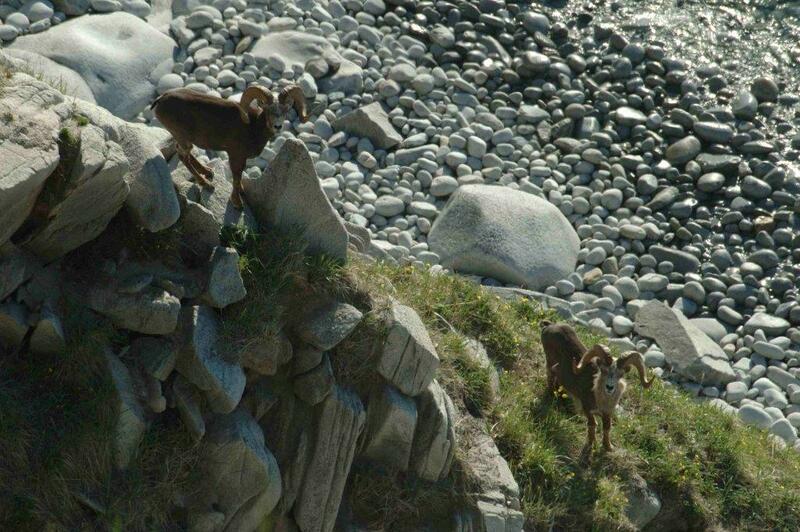 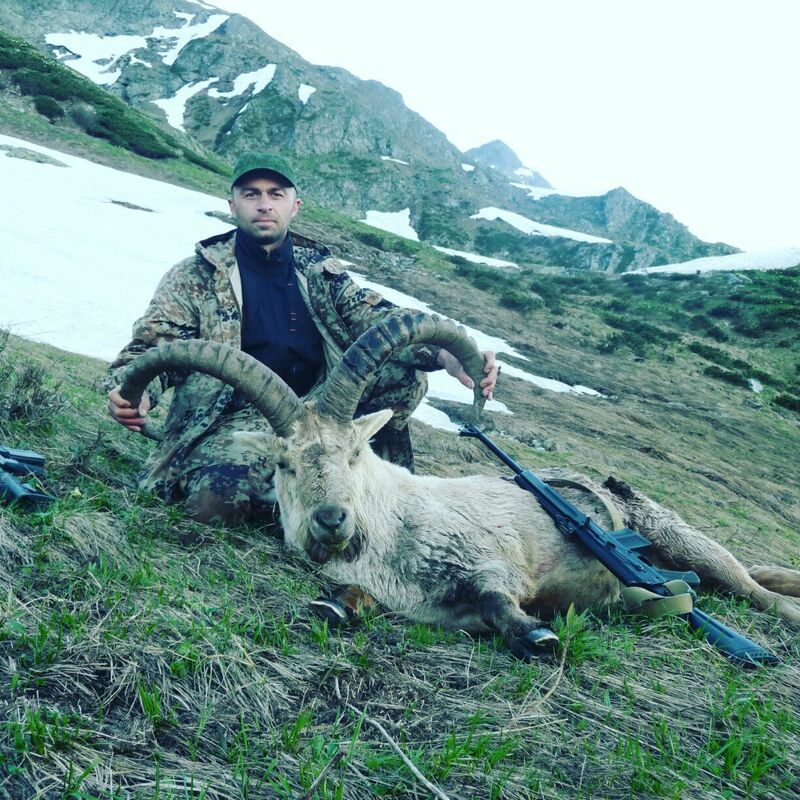 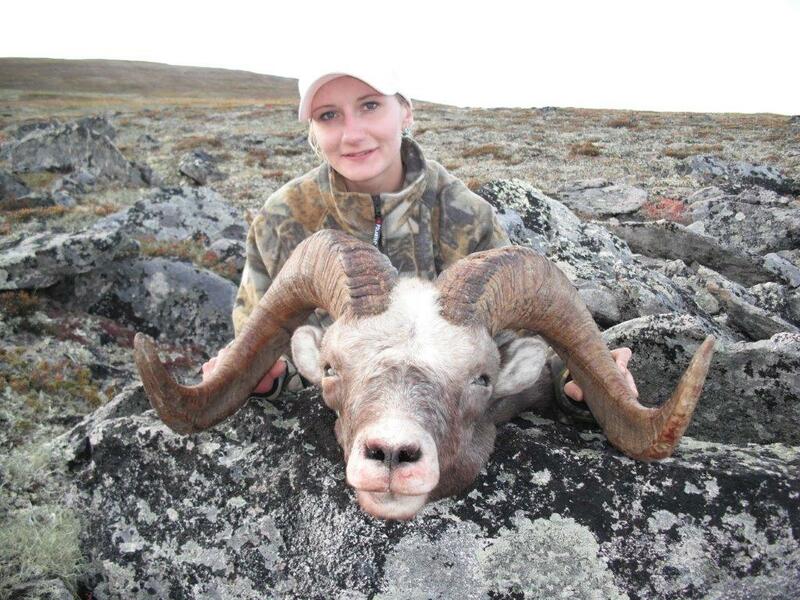 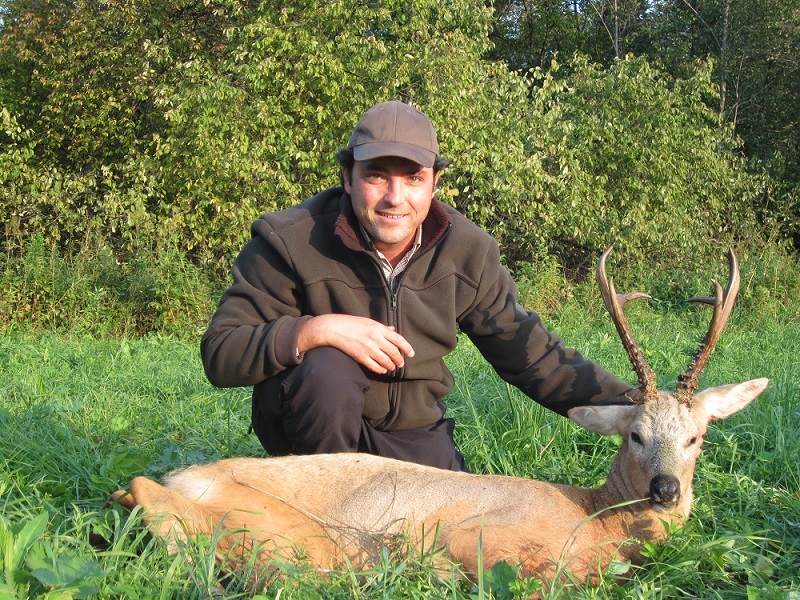 Hunting season: August 25 – September 30 (Rutting time) with the best time August 25 – September 10. 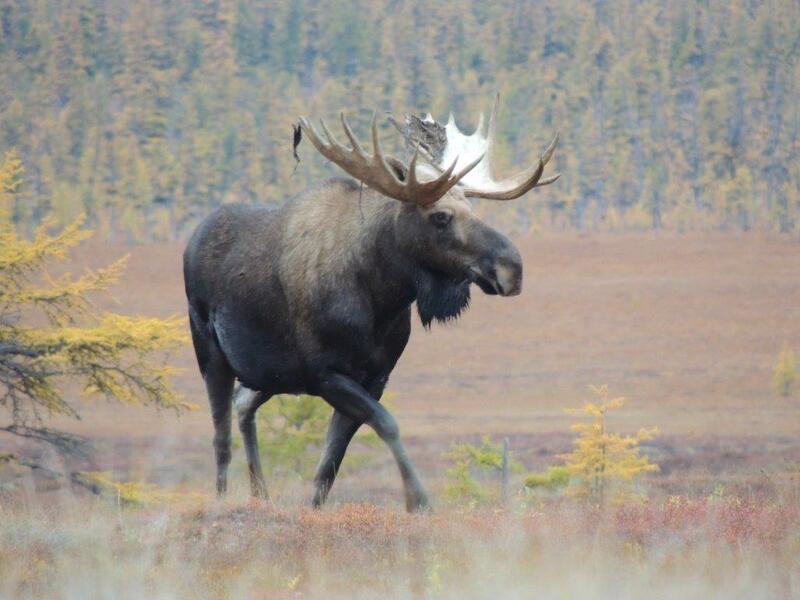 From the 5 of September you can add Moose to your tag. 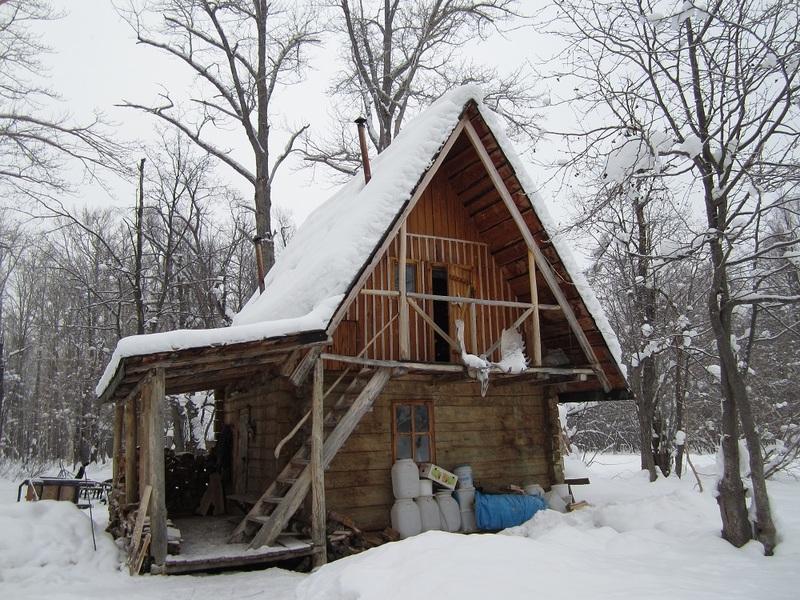 The region is located mainly within the mountainous South Ural area. 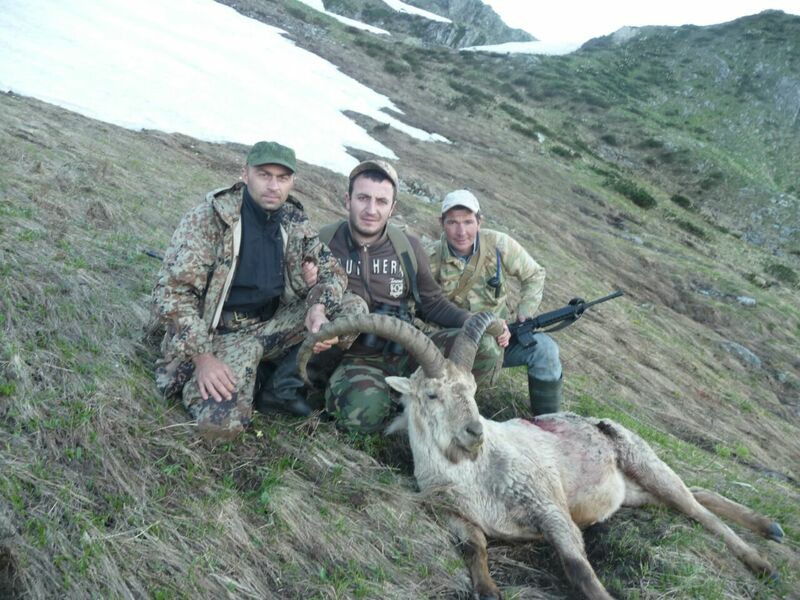 The highest point is 1406 m – Nurlat Mountain. 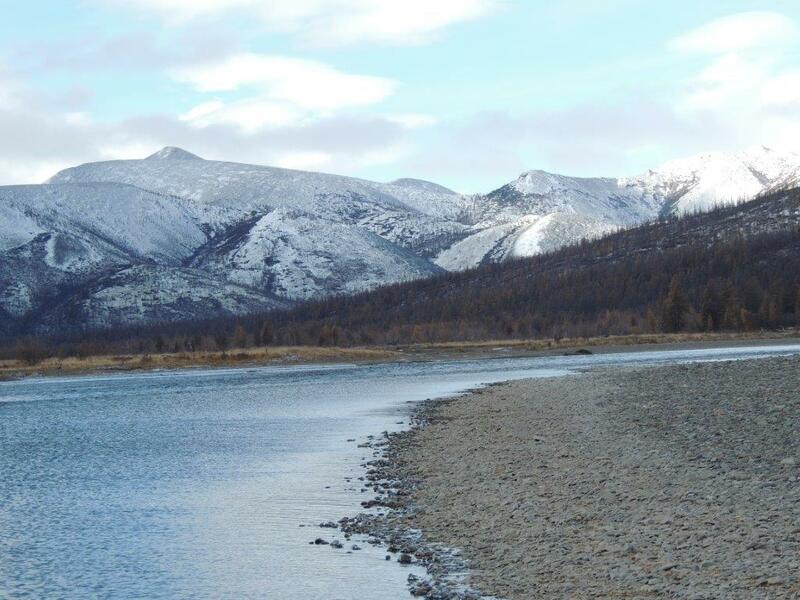 The region has mountains and hills in the west and plains with low hills in the east. 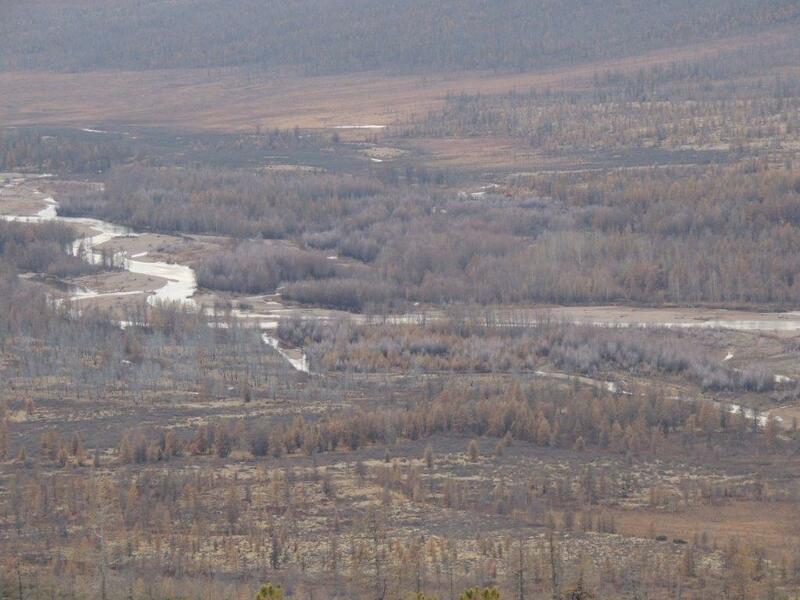 Ural and Miass are the main rivers here. 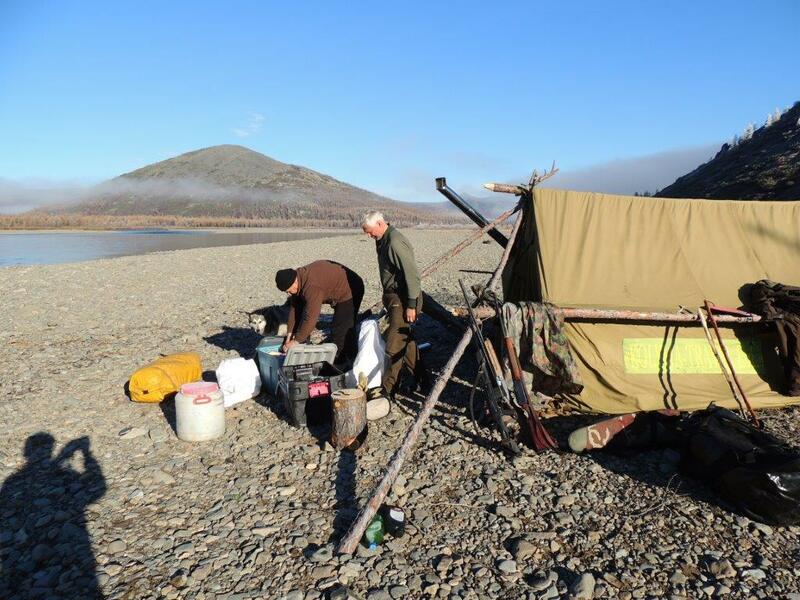 Also there are a lot of fresh and salt-water lakes. 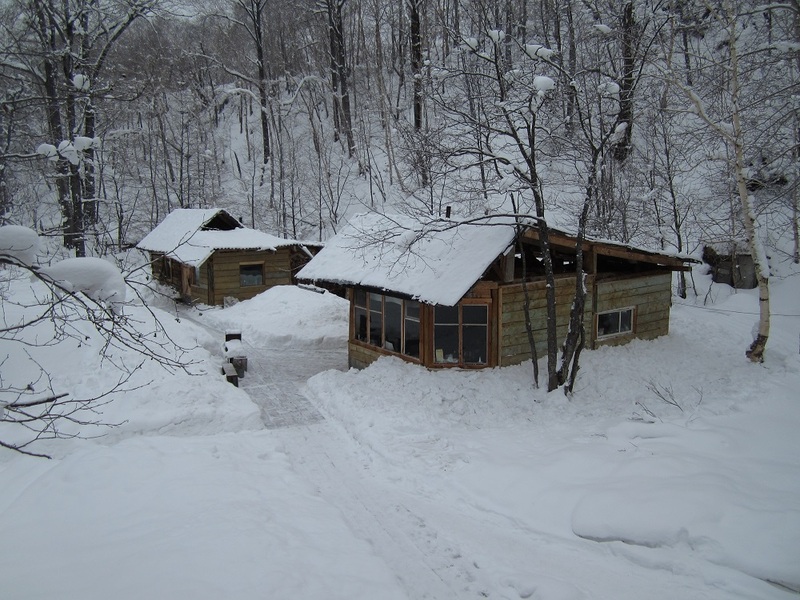 The climate is continental with long cold winter and hot summer. 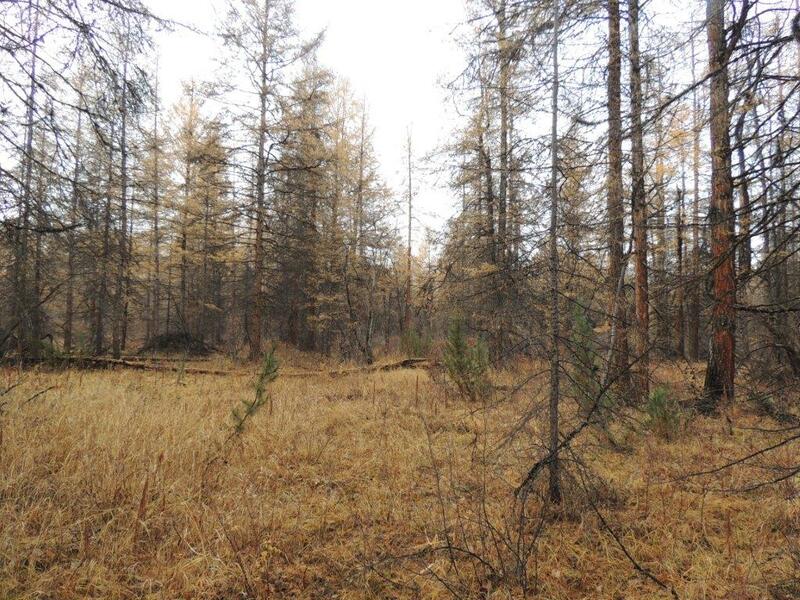 Chelyabinsk region is within the forest steppe and northern steppe zones. 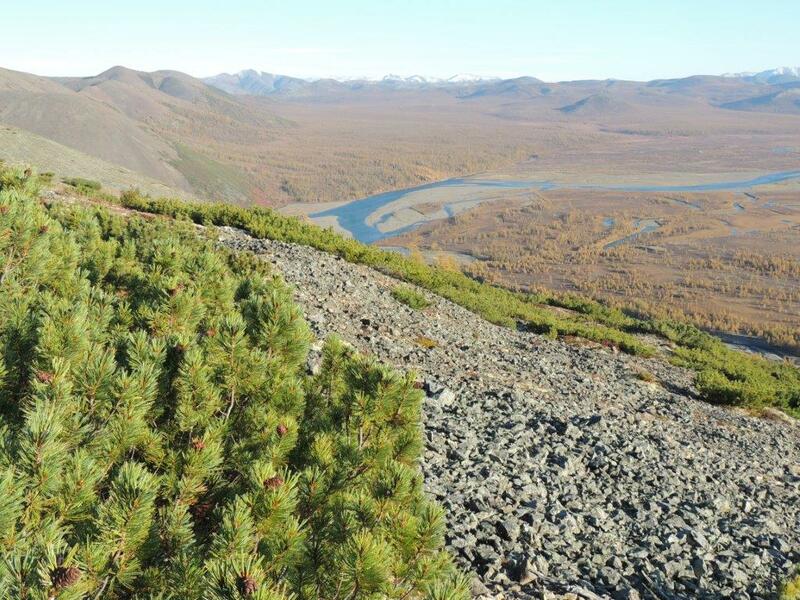 The forests cover up to 25% of the region’s territory. 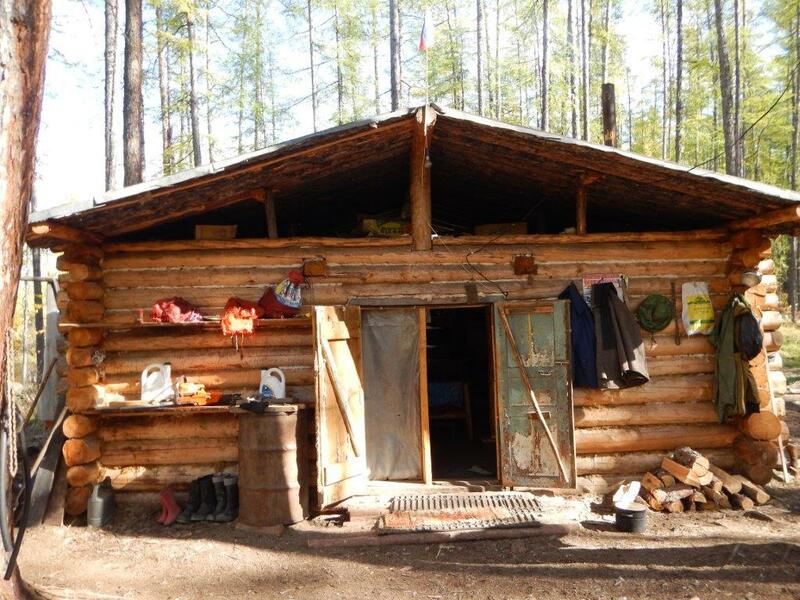 Kurgan region is located at the junction of Ural region and Siberia. 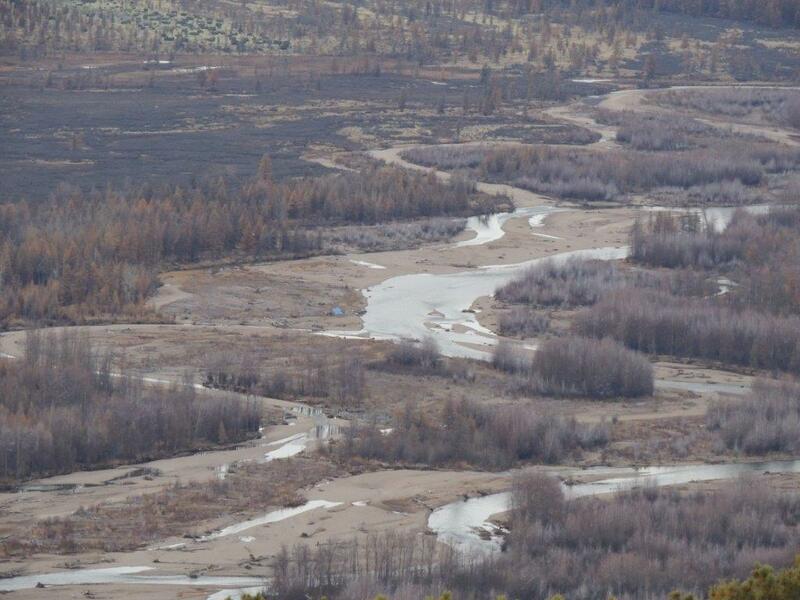 The terrain is mostly plains. 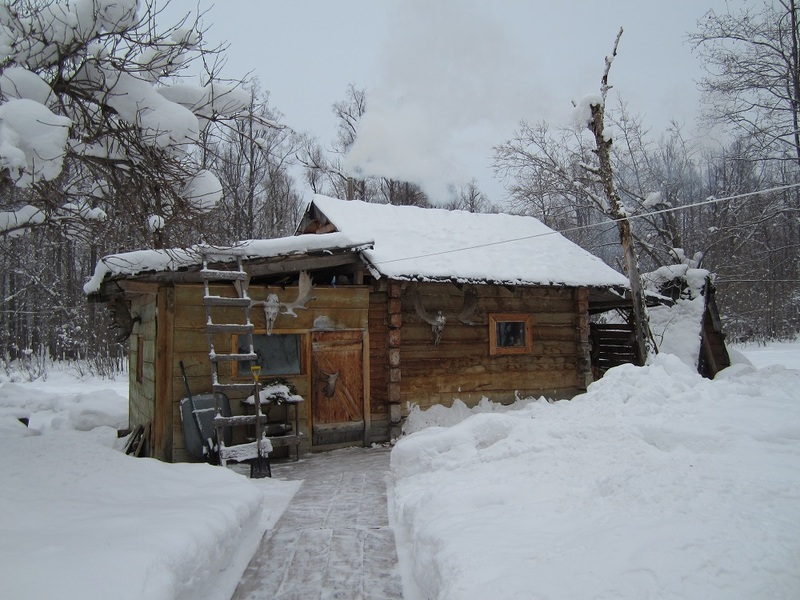 The climate is continental with frosty winters and hot summer. 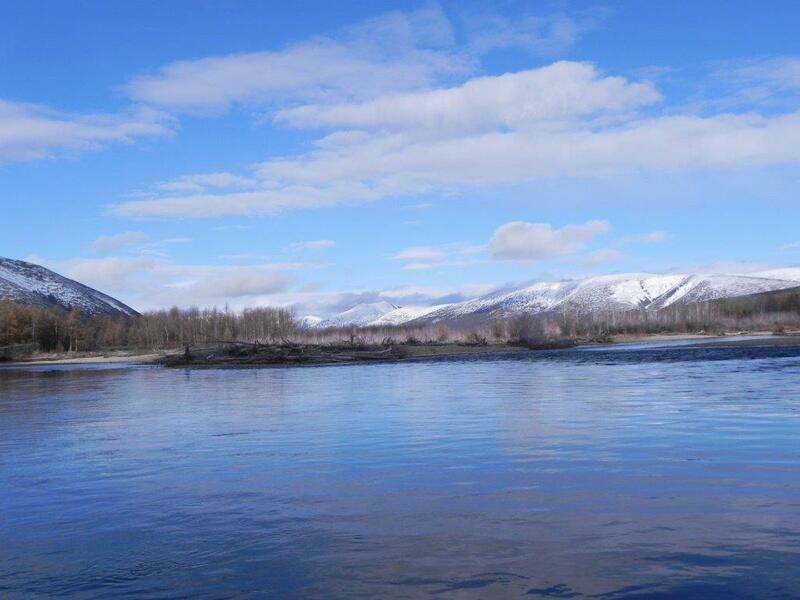 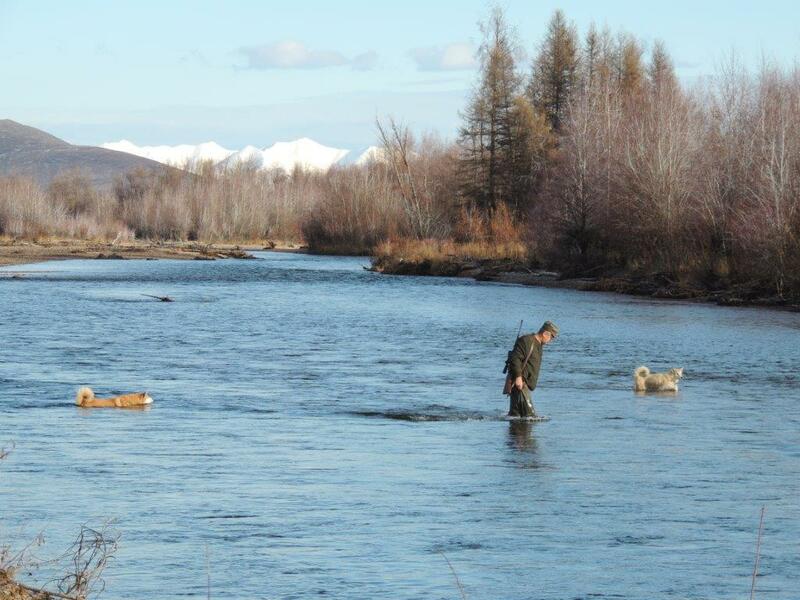 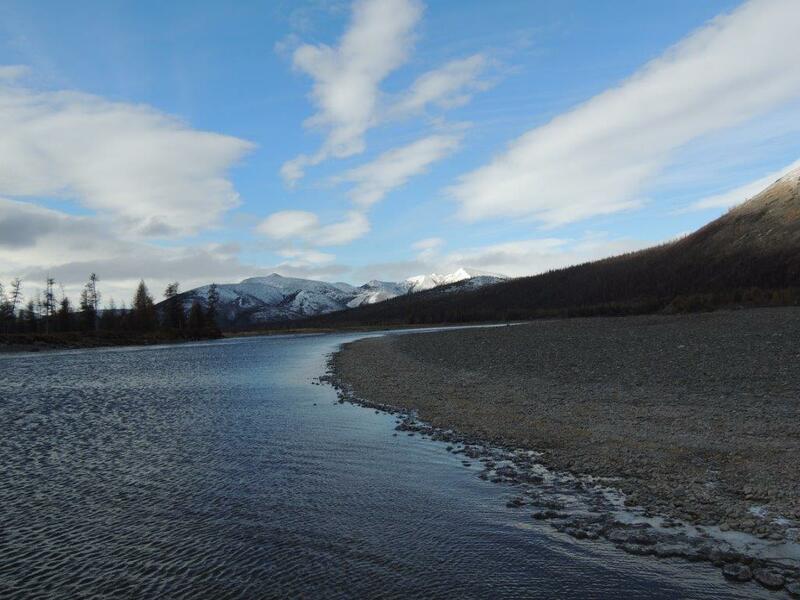 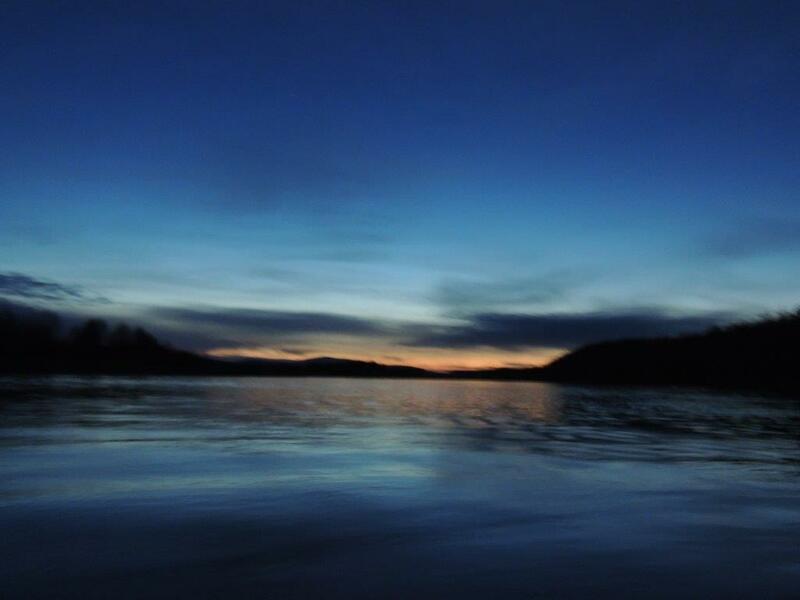 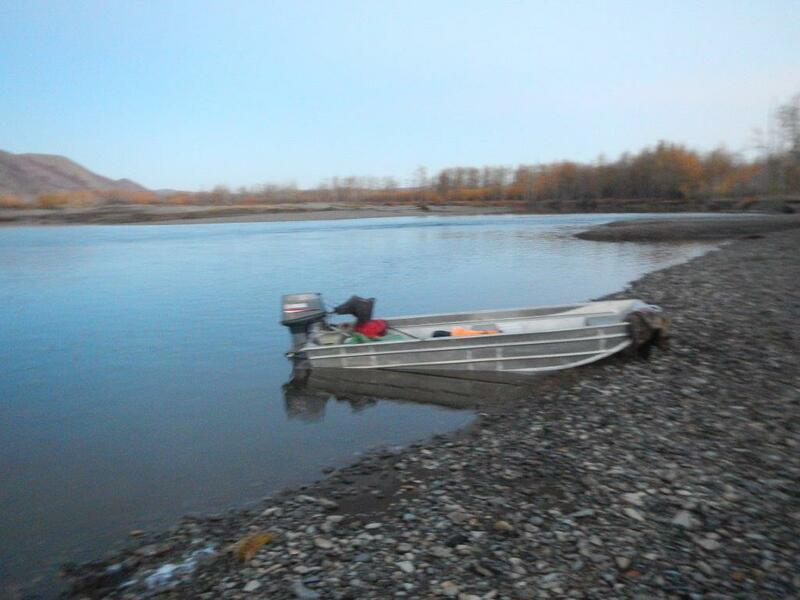 There are 449 rivers and creeks and 2943 lakes in this region. 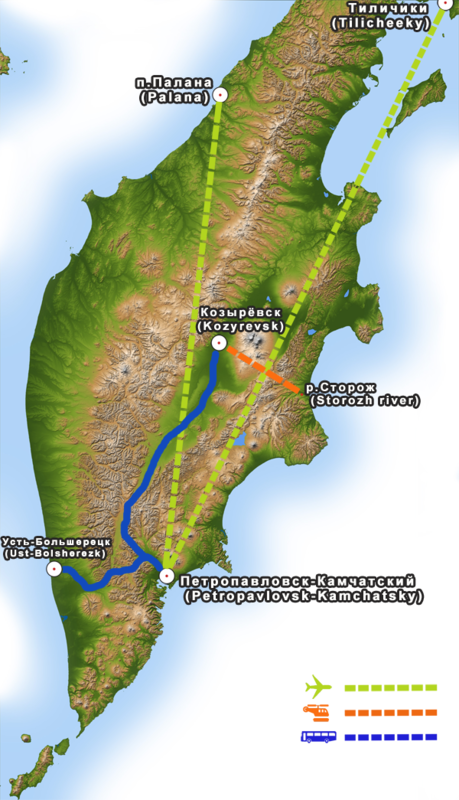 The area is located mainly within forest steppe zone. 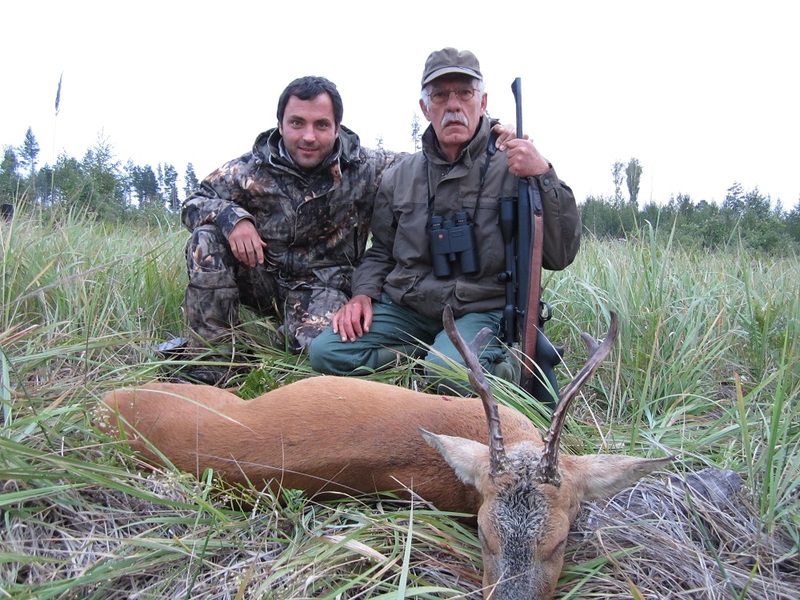 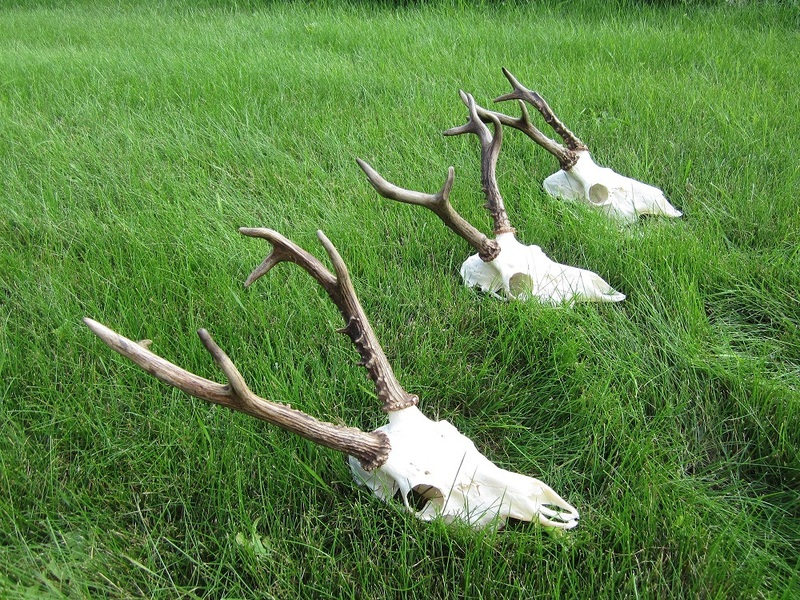 During the rut two hunting methods are used. 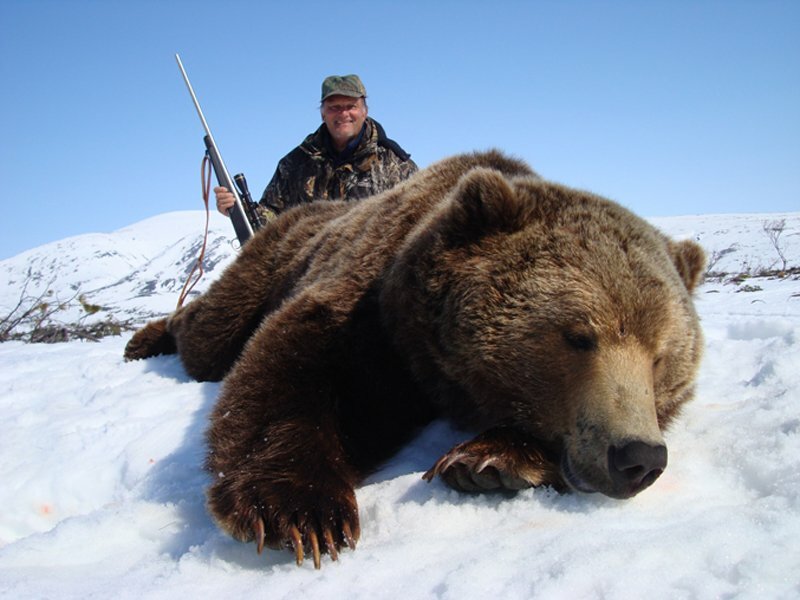 The hunters can wait for the trophy males at certain spots, where the animals usually occur. 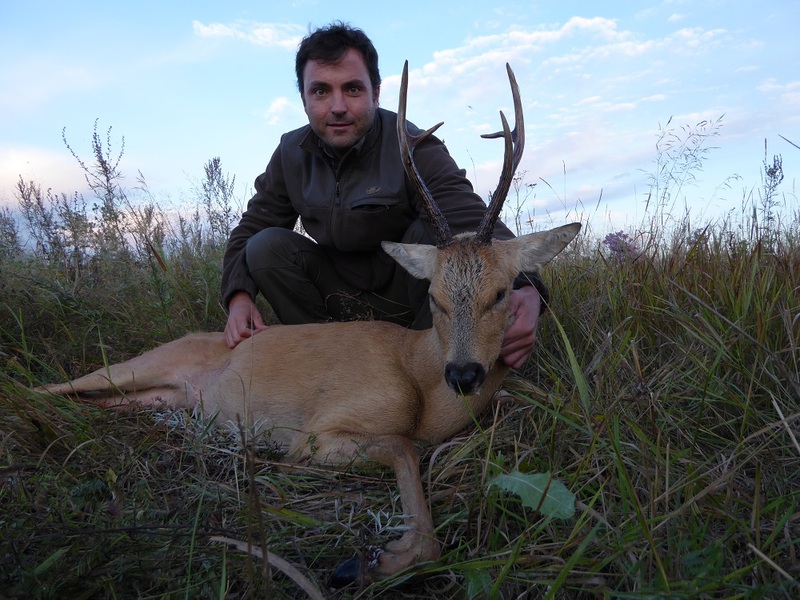 The other way is to travel around the área using a car and hunting on foot by spot-and-stalk. 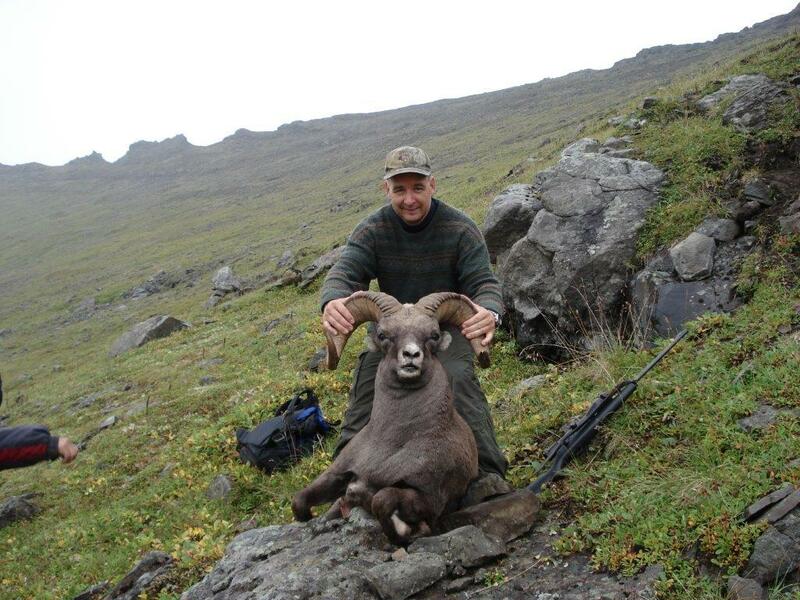 It is found in Sibieria and in the east part of Russia. 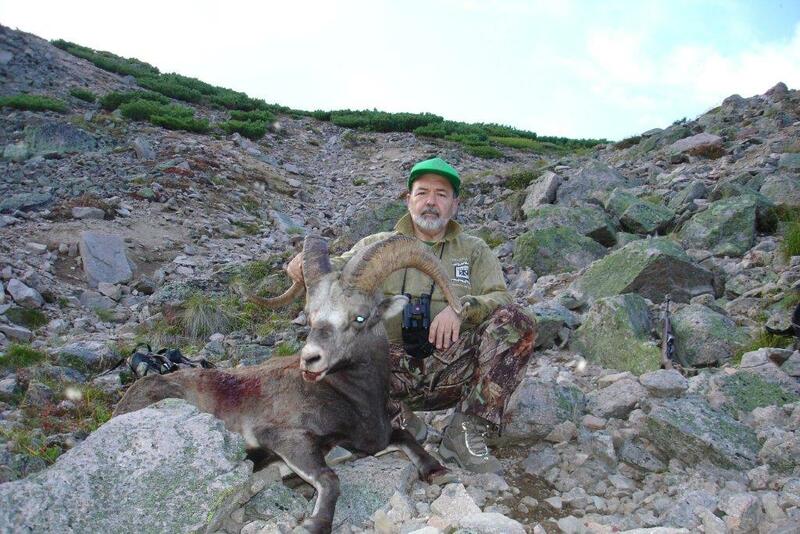 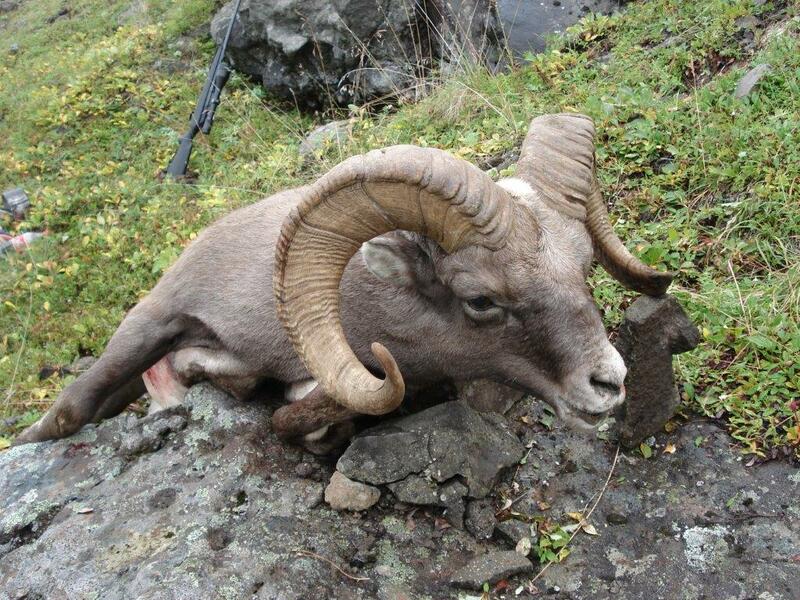 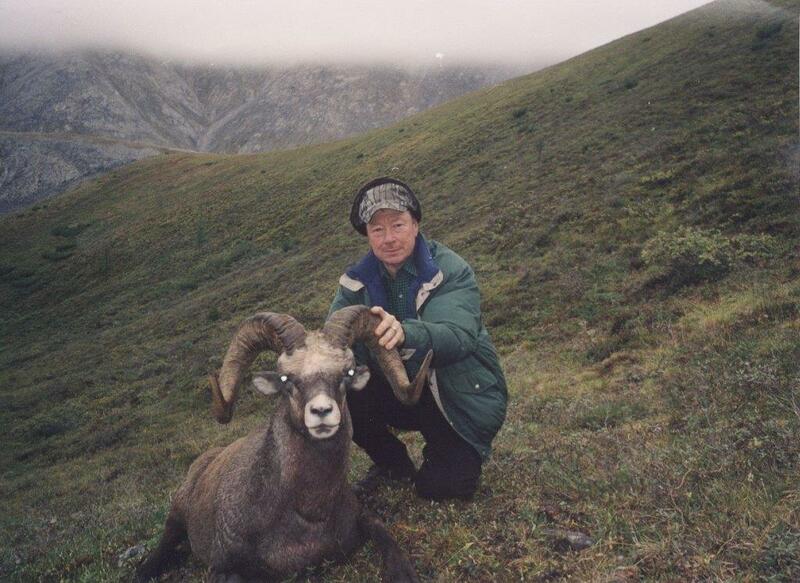 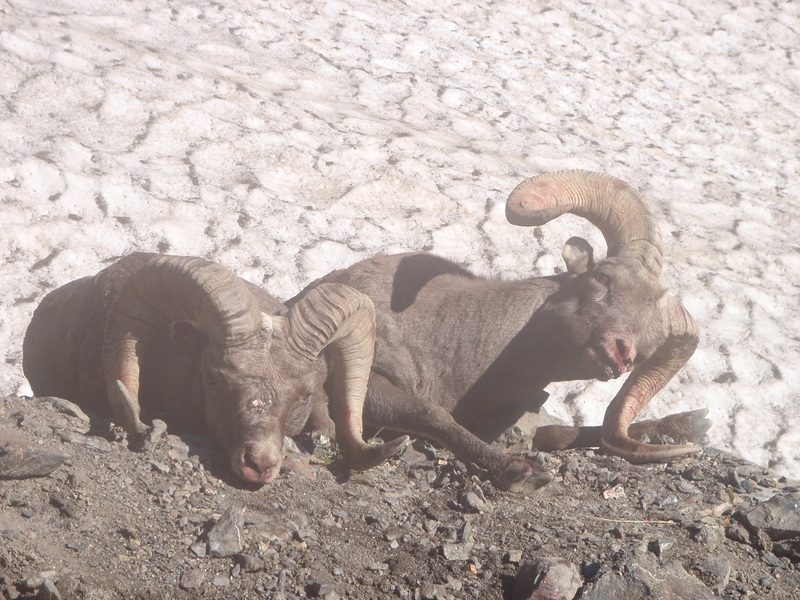 Its horns are similar to the Stone sheep. 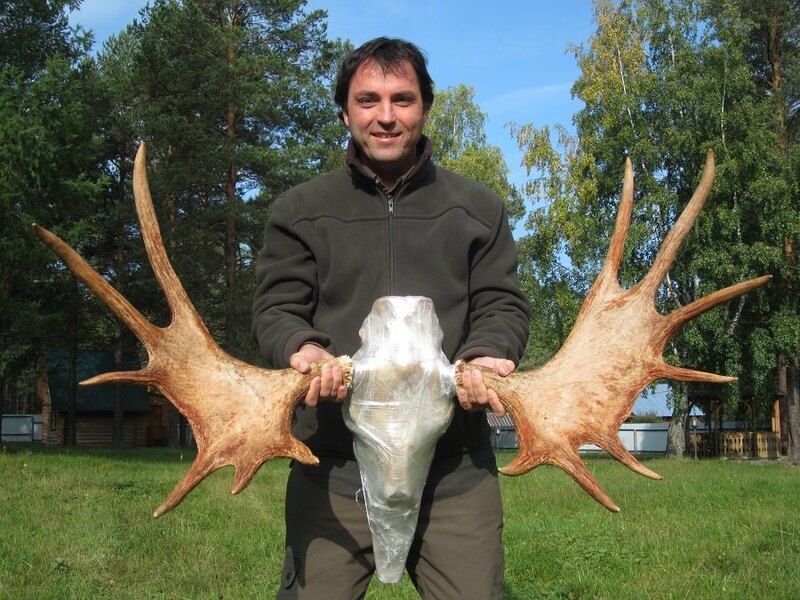 The average size is 35-39 inches and the succes rate close to 100%. 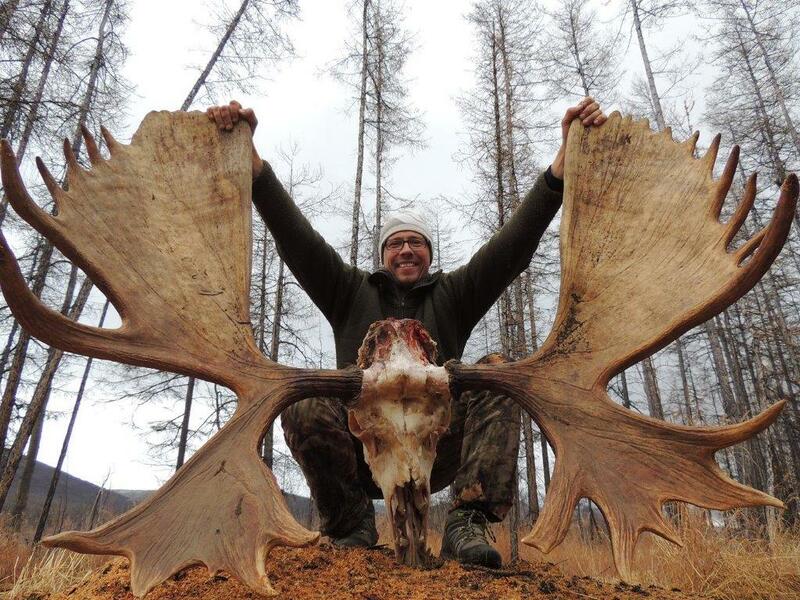 It can be combine with bear and moose.